The economy of the United States is a highly developed mixed economy. It is the world's largest economy by nominal GDP and the second-largest by purchasing power parity (PPP). It also has the world's seventh-highest per capita GDP (nominal) and the eleventh-highest per capita GDP (PPP) in 2016. The US has a highly diversified, world-leading industrial sector. It is also a high-technology innovator with the second-largest industrial output in the world. The U.S. dollar is the currency most used in international transactions and is the world's foremost reserve currency, backed by its science and technology, its military, the full faith of the U.S. government to reimburse its debts, its central role in a range of international institutions since World War II, and the petrodollar system. Several countries use it as their official currency, and in many others, it is the de facto currency. Its largest trading partners are China, Canada, Mexico, Japan, Germany, South Korea, United Kingdom, France, India, and Taiwan. The nation's economy is fueled by abundant natural resources, a well-developed infrastructure, and high productivity. It has the second-highest total-estimated value of natural resources, valued at $45 trillion in 2016. Americans have the highest average household and employee income among OECD nations, and in 2010, they had the fourth-highest median household income, down from second-highest in 2007. The United States has held the world's largest national economy (not including colonial empires) since at least the 1890s. It is the world's largest producer of oil and natural gas. In 2016, it was the world's largest trading nation as well as its second-largest manufacturer, representing a fifth of the global manufacturing output. The U.S. also has both the largest economy and the largest industrial sector, at 2005 prices according to the UNCTAD. The U.S. not only has the largest internal market for goods, but also dominates the trade in services. U.S. total trade amounted to $4.92 trillion in 2016. Of the world's 500 largest companies, 134 are headquartered in the US. The U.S. has one of the world's largest and most influential financial markets. 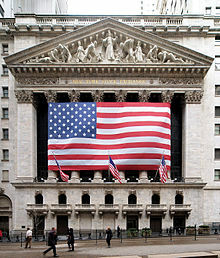 The New York Stock Exchange is by far the world's largest stock exchange by market capitalization. Foreign investments made in the U.S. total almost $2.4 trillion, while American investments in foreign countries total to over $3.3 trillion. The U.S. economy is ranked first in international ranking on venture capital and Global Research and Development funding. Consumer spending comprised 68% of the U.S. economy in 2018. The U.S. has the world's largest consumer market, with a household final consumption expenditure five times larger than that of Japan. The nation's labor market has attracted immigrants from all over the world and its net migration rate is among the highest in the world. The U.S. is one of the top-performing economies in studies such as the Ease of Doing Business Index, the Global Competitiveness Report, and others. The U.S. economy experienced a serious economic downturn during the Great Recession which technically lasted from December 2007 – June 2009. However, real GDP regained its pre-crisis (late 2007) peak by 2011, household net worth by Q2 2012, non-farm payroll jobs by May 2014, and the unemployment rate by September 2015. Each of these variables continued into post-recession record territory following those dates, with the U.S. recovery becoming the second-longest on record in April 2018. Debt held by the public, a measure of national debt, was approximately 77% of GDP in 2017, ranked the 43rd highest out of 207 countries. Income inequality ranked 41st highest among 156 countries in 2017, and ranks among the highest in income inequality compared to other Western nations. The economic history of the United States began with American settlements in the 17th and 18th centuries. The American colonies went from marginally successful colonial economies to a small, independent farming economy, which in 1776 became the United States of America. In 180 years, the U.S. grew to a huge, integrated, industrialized economy that made up around one-fifth of the world economy. As a result, the U.S. GDP per capita converged on and eventually surpassed that of the UK, as well as other nations that it previously trailed economically. The economy maintained high wages, attracting immigrants by the millions from all over the world. In the early 1800s, the United States was largely agricultural with more than 80 percent of the population in farming. Most of the manufacturing centered on the first stages of transformation of raw materials with lumber and saw mills, textiles and boots and shoes leading the way. 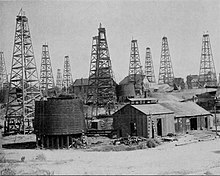 The rich resource endowments contributed to the rapid economic expansion during the nineteenth century. Ample land availability allowed the number of farmers to keep growing, but activity in manufacturing, services, transportation and other sectors grew at a much faster pace. Thus, by 1860 the share of the farm population in the U.S. had fallen from over 80 percent to roughly 50 percent. In the 19th century, recessions frequently coincided with financial crises. The Panic of 1837 was followed by a five-year depression, with the failure of banks and then-record-high unemployment levels. Because of the great changes in the economy over the centuries, it is difficult to compare the severity of modern recessions to early recessions. Recessions after World War II appear to have been less severe than earlier recessions, but the reasons for this are unclear. At the beginning of the century new innovations and improvements in existing innovations opened the door for improvements in the standard of living among American consumers. Many firms grew large by taking advantage of economies of scale and better communication to run nationwide operations. Concentration in these industries raised fears of monopoly that would drive prices higher and output lower, but many of these firms were cutting costs so fast that trends were towards lower price and more output in these industries. Lots of workers shared the success of these large firms, which typically offered the highest wages in the world. 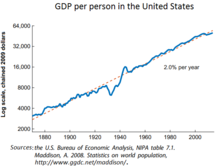 The United States has been the world's largest national economy in terms of GDP since at least the 1920s. For many years following the Great Depression of the 1930s, when danger of recession appeared most serious, the government strengthened the economy by spending heavily itself or cutting taxes so that consumers would spend more, and by fostering rapid growth in the money supply, which also encouraged more spending. Ideas about the best tools for stabilizing the economy changed substantially between the 1930s and the 1980s. From the New Deal era that began in 1933, to the Great Society initiatives of the 1960s, national policy makers relied principally on fiscal policy to influence the economy. During the world wars of the twentieth century, the United States fared better than the rest of the combatants because none of the First World War and relatively little of the Second World War was fought on American territory (and none on the then 48 states). Yet, even in the United States, the wars meant sacrifice. During the peak of Second World War activity, nearly 40 percent of U.S. GDP was devoted to war production. Decisions about large swaths of the economy were largely made for military purposes and nearly all relevant inputs were allocated to the war effort. Many goods were rationed, prices and wages controlled and many durable consumer goods were no longer produced. Large segments of the workforce were inducted into the military, paid half wages, and roughly half of those were sent into harm's way. The approach, advanced by British economist John Maynard Keynes, gave elected officials a leading role in directing the economy since spending and taxes are controlled by the U.S. President and the Congress. The "Baby Boom" saw a dramatic increase in fertility in the period 1942–1957; it was caused by delayed marriages and childbearing during depression years, a surge in prosperity, a demand for suburban single-family homes (as opposed to inner city apartments) and new optimism about the future. The boom crested about 1957, then slowly declined. A period of high inflation, interest rates and unemployment after 1973 weakened confidence in fiscal policy as a tool for regulating the overall pace of economic activity. The U.S. economy grew by an average of 3.8% from 1946 to 1973, while real median household income surged 74% (or 2.1% a year). The worst recession in recent decades, in terms of lost output, occurred during the financial crisis of 2007–08, when GDP fell by 5.0% from the spring of 2008 to the spring of 2009. Other significant recessions took place in 1957–58, when GDP fell 3.7%, following the 1973 oil crisis, with a 3.1% fall from late 1973 to early 1975, and in the 1981–82 recession, when GDP dropped by 2.9%. Recent, mild recessions have included the 1990–91 downturn, when output fell by 1.3%, and the 2001 recession, in which GDP slid by 0.3%; the 2001 downturn lasted just eight months. The most vigorous, sustained periods of growth, on the other hand, took place from early 1961 to mid-1969, with an expansion of 53% (5.1% a year), from mid-1991 to late in 2000, at 43% (3.8% a year), and from late 1982 to mid-1990, at 37% (4% a year). In the 1970s and 1980s, it was popular in the U.S. to believe that Japan's economy would surpass that of the U.S., but this did not happen. The United States economy experienced a recession in 2001 with an unusually slow jobs recovery, with the number of jobs not regaining the February 2001 level until January 2005. This "jobless recovery" overlapped with the building of a housing bubble and arguably a wider debt bubble, as the ratio of household debt to GDP rose from a record level of 70% in Q1 2001 to 99% in Q1 2008. Homeowners were borrowing against their bubble-priced homes to fuel consumption, driving up their debt levels while providing an unsustainable boost to GDP. When housing prices began falling in 2006, the value of securities backed by mortgages fell dramatically, causing the equivalent of a bank run in the essentially unregulated non-depository banking system, which had outgrown the traditional, regulated depository banking system. Many mortgage companies and other non-depository banks (e.g., investment banks) faced a worsening crisis in 2007–2008, with the banking crisis peaking in September 2008, with the bankruptcy of Lehman Brothers and bailouts of several other financial institutions. The Bush administration (2001–2009) and Obama administrations (2009–2017) applied banking bailout programs and Keynesian stimulus via high government deficits, while the Federal Reserve maintained near-zero interest rates. These measures helped the economy recover, as households paid down debts in 2009–2012, the only years since 1947 where this occurred, presenting a significant barrier to recovery. Real GDP regained its pre-crisis (late 2007) peak by 2011, household net worth by Q2 2012, non-farm payroll jobs by May 2014, and the unemployment rate by September 2015. Each of these variables continued into post-recession record territory following those dates, with the U.S. recovery becoming the second longest on record in April 2018. Debt held by the public, a measure of national debt, has risen throughout the 21st century, rising from 31% in 2000 to 52% in 2009 and 77% of GDP in 2017, which was ranked 43rd highest out of 207 countries. Income inequality peaked in 2007 and fell during the Great Recession, yet still ranked 41st highest among 156 countries in 2017 (i.e., 74% of countries had a more equal income distribution). The following table shows the main economic indicators in 1980–2018. 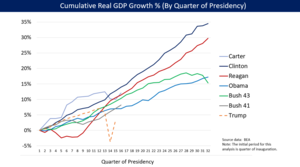 U.S. cumulative real (inflation-adjusted) GDP growth by Presidents from Reagan to Obama. U.S. nominal GDP was $19.5 trillion in 2017. Annualized, nominal GDP reached $20.1 trillion in Q1 2018, the first time it exceeded the $20 trillion level. About 70% of U.S. GDP is personal consumption, with business investment 18%, government 17% (federal, state and local but excluding transfer payments such as Social Security, which is in consumption) and net exports a negative 3% due to the U.S. trade deficit. Real gross domestic product, a measure of both production and income, grew by 2.3% in 2017, vs. 1.5% in 2016 and 2.9% in 2015. Real GDP grew at a quarterly annualized rate of 2.2% in Q1 2018 and 4.1% in Q2 2018 under President Trump; the Q2 rate was the best growth rate since Q3 2014. As of 2014, China passed the U.S. as the largest economy in GDP terms, measured at purchasing power parity conversion rates. The U.S. was the largest economy for more than a century prior to that milestone; China has more than tripled the U.S. growth rate for each of the past 40 years. As of 2017, the European Union as an aggregate had a GDP roughly 5% larger than the U.S.
Real GDP per capita (measured in 2009 dollars) was $52,444 in 2017 and has been growing each year since 2010. It grew 3.0% per year on average in the 1960s, 2.1% in the 1970s, 2.4% in the 1980s, 2.2% in the 1990s, 0.7% in the 2000s, and 0.9% from 2010 to 2017. Reasons for slower growth since 2000 are debated by economists and may include aging demographics, slower population and growth in labor force, slower productivity growth, reduced corporate investment, greater income inequality reducing demand, lack of major innovations, and reduced labor power. The U.S. ranked 20th out of 220 countries in GDP per capita in 2017. Among the modern U.S. Presidents, Bill Clinton had the highest cumulative percent real GDP increase during his two terms, Reagan second and Obama third. The development of the nation's GDP according to World Bank: US real GDP grew by an average of 1.7% from 2000 to the first half of 2014, a rate around half the historical average up to 2000. Nominal GDP Sector Composition, 2016 (in millions of dollars) at current prices. 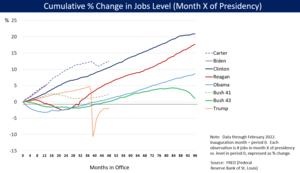 Job growth by U.S. President, measured as cumulative percentage change from month after inauguration to end of term. 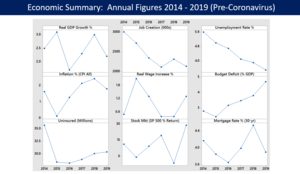 Panel chart illustrates nine key economic variables measured annually in 2014–2017. The years 2014–2016 were during President Obama's second term, while 2017 was during President Trump's first term. Refer to citations on detail page. There were approximately 160.4 million in the U.S. labor force in 2017, the fourth largest labor force in the world behind China, India, and the European Union. The government (federal, state and local) employed 22 million in 2010. Small businesses are the nation's largest employer representing 53% of American workers. The second-largest share of employment belongs to large businesses employing 38% of the U.S. workforce. The nation's private sector employs 91% of working Americans. 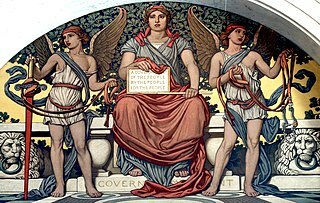 Government accounts for 8% of all U.S. workers. Over 99% of all employing organizations in the U.S. are small businesses. The 30 million small businesses in the U.S. account for 64% of newly-created jobs (those created minus those lost). Jobs in small businesses accounted for 70% of those created in the last decade. The proportion of Americans employed by small business versus large business has remained relatively the same year by year as some small businesses become large businesses and just over half of small businesses survive for more than 5 years. Amongst large businesses, several of the largest companies and employers in the world are American companies. Amongst them are Walmart, which is both the largest company and the largest private sector employer in the world. Walmart employs 2.1 million people worldwide and 1.4 million in the U.S. alone. There are nearly 30 million small businesses in the US. Minorities such as Hispanics, African Americans, Asian Americans, and Native Americans (35% of the country's population), own 4.1 million of the nation's businesses. Minority-owned businesses generate almost $700 billion in revenue, and they employ almost 5 million workers in the U.S.  Americans have the highest average employee income among OECD nations. The median household income in the U.S. as of 2008 is $52,029. About 284,000 working people in the U.S. have two full-time jobs and 7.6 million have part-time ones in addition to their full-time employments. Out of all working individuals in the US, 12% belong to a labor union and most union members work for the government. The decline of union membership in the U.S. over the last several decades parallels that of labor's share of the economy. The World Bank ranks the United States first in the ease of hiring and firing workers. The United States is the only advanced economy that does not legally guarantee its workers paid vacation or paid sick days, and is one of just a few countries in the world without paid family leave as a legal right, with the others being Papua New Guinea, Suriname and Liberia. In 2014, the International Trade Union Confederation graded the U.S. a 4 out of 5+, its third-lowest score, on the subject of powers and rights granted to labor unions. 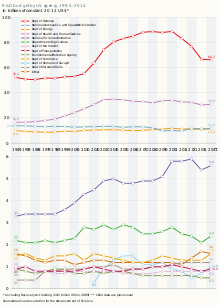 Line chart showing unemployment rate trends in 2000–2017, for the U3 and U6 measures. As of December 2017, the unemployment rate in the U.S. was 4.1% or 6.6 million people. The government's broader U-6 unemployment rate, which includes the part-time underemployed, was 8.1% or 8.2 million people. These figures were calculated with a civilian labor force of approximately 160.6 million people, relative to a U.S. population of approximately 327 million people. Between 2009 and 2010, following the Great Recession, the emerging problem of jobless recoveries resulted in record levels of long-term unemployment with over 6 million workers looking for work for more than 6 months as of January 2010. This particularly affected older workers. A year after the recession ended in June 2009, immigrants gained 656,000 jobs in the US, while U.S.-born workers lost more than a million jobs, due in part to an aging country (relatively more white retirees) and demographic shifts. In April 2010, the official unemployment rate was 9.9%, but the government's broader U-6 unemployment rate was 17.1%. Between February 2008 and February 2010, the number of people working part-time for economic reasons (i.e., would prefer to work full-time) increased by 4 million to 8.8 million, an 83% increase in part-time workers during the two-year period. By 2013, although the unemployment rate had fallen below 8%, the record proportion of long term unemployed and continued decreasing household income remained indicative of a jobless recovery. However, the number of payroll jobs returned to its pre-recession (November 2007) level by May 2014 as the economy recovered. After being higher in the postwar period, the U.S. unemployment rate fell below the rising eurozone unemployment rate in the mid-1980s and has remained significantly lower almost continuously since. In 1955, 55% of Americans worked in services, between 30% and 35% in industry, and between 10% and 15% in agriculture. By 1980, over 65% were employed in services, between 25% and 30% in industry, and less than 5% in agriculture. Male unemployment continued to be significantly higher than those of females (at 9.8% vs. 7.5% in 2009). The unemployment among Caucasians continues being much lower than those for African-Americans (at 8.5% vs. 15.8% also in 2009). The youth unemployment rate was 18.5% in July 2009, the highest rate in that month since 1948. The unemployment rate of young African Americans was 28.2% in May 2013. The unemployment rate for the city of Detroit is officially 27%, but Detroit News suggests that nearly half of that city's working-age population may be unemployed. US employment, as estimated in 2012, is divided into 79.7% in the service sector, 19.2% in the manufacturing sector, and 1.1% in the agriculture sector. United States non-farm employment by industry sector February 2013. U.S. share of income (pre-tax and after-tax) earned by top 1% households in 1979, 2007, and 2015 (CBO data). The first date (1979) reflects the more egalitarian pre-1980 period, 2007 was the peak inequality of the post-1980 period, and the 2015 number reflects the Obama tax increases on the top 1% along with residual effects of the Great Recession. Real (i.e., inflation-adjusted) median household income, a good measure of middle-class income, was $59,039 in 2016, a record level. However, it was just above the previous record set in 1998, indicating the purchasing power of middle-class family income has been stagnant or down for much of the past 20 years. During 2013, employee compensation was $8.969 trillion, while gross private investment totals $2.781 trillion. Americans have the highest average household income among OECD nations, and in 2010 had the fourth-highest median household income, down from second-highest in 2007. According to one analysis middle-class incomes in the United States fell into a tie with those in Canada in 2010, and may have fallen behind by 2014, while several other advanced economies have closed the gap in recent years. Income inequality has become a hotly debated topic globally. According to the CIA World Factbook, U.S. income inequality ranked 41st highest among 156 countries in 2017 (i.e., 74% of countries have a more equal income distribution). According to the Congressional Budget Office, the top 1% of income households earned about a 9% share of the pre-tax income in 1979, versus 19% in 2007 and 17% in 2014. For after-tax income, these figures were 7%, 17%, and 13%, respectively. These figures indicate the share of income earned by top earners more than doubled between 1979 and 2007, then fell somewhat following the Great Recession, and the higher tax rates and re-distributive policies applied by President Barack Obama in 2013 (i.e., expiration of the Bush Tax Cuts for the top 1% and subsidies for lower income persons via the Affordable Care Act). Recasting the 2012 income using the 1979 income distribution (representing the more egalitarian 1950–1980 period), the bottom 99% of families would have averaged about $7,100 more income. Income inequality in the United States has grown from 2005 to 2012 in more than 2 out of 3 metropolitan areas. The top 1 percent of income-earners accounted for 52 percent of the income gains from 2009 to 2015, where income is defined as market income excluding government transfers, while their share of total income has more than doubled from 9 percent in 1976 to 20 percent in 2011. According to a 2014 OECD report, 80% of total pre-tax market income income growth went to the top 10% from 1975 to 2007. A number of economists and others have expressed growing concern about income inequality, calling it "deeply worrying", unjust, a danger to democracy/social stability, or a sign of national decline. Yale professor Robert Shiller has said, "The most important problem that we are facing now today, I think, is rising inequality in the United States and elsewhere in the world." Thomas Piketty of the Paris School of Economics argues that the post-1980 increase in inequality played a role in the 2008 crisis by contributing to the nation's financial instability. In 2016, the economists Peter H. Lindert and Jeffrey G. Williamson claimed that inequality is the highest it has been since the nation's founding. Others disagree, saying that the inequality issue is a political distraction from what they consider real problems like chronic unemployment and sluggish growth. George Mason University economics professor Tyler Cowen has called inequality a "red herring", saying that factors driving its increase within a nation can simultaneously be driving its reduction globally, and arguing that redistributive policies intended to reduce inequality can do more harm than good regarding the real problem of stagnant wages. Robert Lucas Jr. has argued that the salient problem American living standards face is a government that has grown too much, and that recent policy shifts in the direction of European-style taxation, welfare spending, and regulation may be indefinitely putting the U.S. on a significantly lower, European level income trajectory. Some researchers have disputed the accuracy of the underlying data regarding claims about inequality trends, and economists Michael Bordo and Christopher M. Meissner have argued that inequality cannot be blamed for the 2008 financial crisis. According to a report by the Congressional Research Service, decreased progressiveness in capital gains taxes was the largest contributor to the increase in overall income inequality in the U.S. from 1996 to 2006. As of 2010 The U.S. had the fourth-widest income distribution among OECD nations, behind Turkey, Mexico, and Chile. The Brookings Institution said in March 2013 that income inequality was increasing and becoming permanent, sharply reducing social mobility in the US. The OECD ranks the U.S. 10th in social mobility, behind the Nordic countries, Australia, Canada, Germany, Spain, and France. Of the major developed nations, only Italy and Great Britain have lower mobility. This has been partly attributed to the depth of American poverty, which leaves poor children economically disadvantaged, though others have observed that a relative rise in the U.S. is mathematically harder due to its higher and more widely distributed income range than in nations with artificial income compression, even if one enjoys more absolute mobility in the U.S., and have questioned how meaningful such international comparisons are. There has been a widening gap between productivity and median incomes since the 1970s. The primary cause for the gap between productivity and income growth is the decline in per capita hours worked. Other causes include the rise in non-cash benefits as a share of worker compensation (which aren't counted in CPS income data), immigrants entering the labor force, statistical distortions including the use of different inflation adjusters by the BLS and CPS, productivity gains being skewed toward less labor-intensive sectors, income shifting from labor to capital, a skill gap-driven wage disparity, productivity being falsely inflated by hidden technology-driven depreciation increases and import price measurement problems, and/or a natural period of adjustment following an income surge during aberrational postwar circumstances. According to a 2018 study by the OECD, given that the unemployed and at-risk workers get almost no government support and are further set back by a very weak collective bargaining system, the U.S. has much higher income inequality and a larger percentage of low-income workers than almost any other developed nation. As of Q4 2017, total household net worth in the United States was a record $99 trillion, an increase of $5.2 trillion from 2016. This increase reflects both stock market and housing price gains. This measure has been setting records since Q4 2012. If divided evenly, the $99 trillion represents an average of $782,000 per household (for about 126.2 million households) or $302,000 per person. 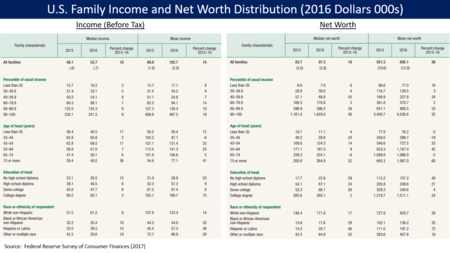 However, median household net worth (i.e., half of the families above and below this level) was $97,300 in 2016. The bottom 25% of families had a median net worth of zero, while the 25th to 50th percentile had a median net worth of $40,000. Wealth inequality is more unequal than income inequality, with the top 1% households owning approximately 42% of the net worth in 2012, versus 24% in 1979. According to a September 2017 report by the Federal Reserve, wealth inequality is at record highs; the top 1% controlled 38.6% of the country's wealth in 2016. The Boston Consulting Group posited in June 2017 report that 1% of the Americans will control 70% of country's wealth by 2021. The top 10% wealthiest possess 80% of all financial assets. Wealth inequality in the U.S. is greater than in most developed countries other than Switzerland and Denmark. Inherited wealth may help explain why many Americans who have become rich may have had a "substantial head start". In September 2012, according to the Institute for Policy Studies, "over 60 percent" of the Forbes richest 400 Americans "grew up in substantial privilege". Median household wealth fell 35% in the US, from $106,591 to $68,839 between 2005 and 2011, due to the Great Recession, but has since recovered as indicated above. About 30% of the entire world's millionaire population resides in the United States (as of 2009[update]). The Economist Intelligence Unit estimated in 2008 that there were 16,600,000 millionaires in the U.S. Furthermore, 34% of the world's billionaires are American (in 2011). The U.S. home ownership rate in Q1 2018 was 64.2%, well below the all-time peak of 69.2% set in Q4 2004 during a housing bubble. Millions of homes were lost to foreclosure during the Great Recession of 2007–2009, bringing the ownership rate to a trough of 62.9% in Q2 2016. The average ownership rate from 1965–2017 was 65.3%. The average home in the United States has more than 700 square feet per person, which is 50%–100% more than the average in other high-income countries. Similarly, ownership rates of gadgets and amenities are relatively high compared to other countries. It was reported by Pew Research Center in 2016 that, for the first time in 130 years, Americans aged 18 to 34 are more likely to live with their parents than in any other housing situation. In one study by ATTOM Data Solutions, in 70% of the counties surveyed, homes are increasingly unaffordable for the average U.S. worker. As of 2018, the number of U.S. citizens residing in their vehicles because they can't find affordable housing has "exploded", particularly in cities with steep increases in the cost of living such as Los Angeles, Portland and San Francisco. In 1970, wages represented more than 51% of the U.S. GDP and profits were less than 5%. But by 2013, wages had fallen to 44% of the economy, while profits had more than doubled to 11%. Inflation-adjusted ("real") per capita disposable personal income rose steadily in the U.S. from 1945 to 2008, but has since remained generally level. In 2005, median personal income for those over the age of 18 ranged from $3,317 for an unemployed, married Asian American female to $55,935 for a full-time, year-round employed Asian American male. According to the U.S. Census men tended to have higher income than women while Asians and Whites earned more than African Americans and Hispanics. The overall median personal income for all individuals over the age of 18 was $24,062 ($32,140 for those age 25 or above) in the year 2005. As a reference point, the minimum wage rate in 2009 and 2017 was $7.25 per hour or $15,080 for the 2080 hours in a typical work year. The minimum wage is a little more than the poverty level for a single person unit and about 50% of the poverty level for a family of four. According to an October 2014 report by the Pew Research Center, real wages have been flat or falling for the last five decades for most U.S. workers, regardless of job growth. Bloomberg reported in July 2018 that real GDP per capita has grown substantially since the Great Recession, but real compensation per hour, including benefits, hasn’t increased at all. An August 2017 survey by CareerBuilder found that 8 out of 10 U.S. workers live paycheck to paycheck. CareerBuilder spokesman Mike Erwin blamed "stagnant wages and the rising cost of everything from education to many consumer goods". According to a survey by the federal Consumer Financial Protection Bureau on the financial well-being of U.S. citizens, roughly half have trouble paying bills, and more than one third have faced hardships such as not being able to afford a place to live, running out of food, or not having enough money to pay for medical care. According to journalist and author Alissa Quart, the cost of living is rapidly outpacing the growth of salaries and wages, including those for traditionally secure professions such as teaching. She writes that "middle-class life is now 30% more expensive than it was 20 years ago." In February 2019, the Federal Reserve Bank of New York reported that 7 million U.S. citizens are 3 months or more behind on their car payments, setting a record. This is considered a red flag by economists, that Americans are struggling to pay bills in spite of a low unemployment rate. Number in Poverty and Poverty Rate: 1959 to 2016. United States. Starting in the 1980s relative poverty rates have consistently exceeded those of other wealthy nations, though analyses using a common data set for comparisons tend to find that the U.S. has a lower absolute poverty rate by market income than most other wealthy nations. Extreme poverty in the United States, meaning households living on less than $2 per day before government benefits, doubled from 1996 levels to 1.5 million households in 2011, including 2.8 million children. In 2013, child poverty reached record high levels, with 16.7 million children living in food insecure households, about 35% more than 2007 levels. As of 2015, 44 percent of children in the United States live with low-income families. In 2016, 12.7% of the U.S. population lived in poverty, down from 13.5% in 2015. The poverty rate rose from 12.5% in 2007 before the Great Recession to a 15.1% peak in 2010, before falling back to just above the 2007 level. In the 1959–1962 period, the poverty rate was over 20%, but declined to the all-time low of 11.1% in 1973 following the War on Poverty begun during the Lyndon Johnson presidency. In June 2016, The IMF warned the United States that its high poverty rate needs to be tackled urgently. The population in extreme-poverty neighborhoods rose by one third from 2000 to 2009. People living in such neighborhoods tend to suffer from inadequate access to quality education; higher crime rates; higher rates of physical and psychological ailment; limited access to credit and wealth accumulation; higher prices for goods and services; and constrained access to job opportunities. As of 2013, 44% of America's poor are considered to be in "deep poverty," with an income 50% or more below the government's official poverty line. According to the US Department of Housing and Urban Development's Annual Homeless Assessment Report, as of 2017[update] there were around 554,000 homeless people in the United States on a given night, or 0.17% of the population. Almost two thirds stayed in an emergency shelter or transitional housing program and the other third were living on the street, in an abandoned building, or another place not meant for human habitation. About 1.56 million people, or about 0.5% of the U.S. population, used an emergency shelter or a transitional housing program between October 1, 2008 and September 30, 2009. Around 44% of homeless people are employed. The United States has one of the least extensive social safety nets in the developed world, reducing both relative poverty and absolute poverty by considerably less than the mean for wealthy nations. Some experts posit that those in poverty live in conditions rivaling the developing world. A May 2018 report by the U.N. Special Rapporteur on extreme poverty and human rights found that over five million people in the United States live "in ‘Third World’ conditions." Over the last three decades the poor in America have been incarcerated at a much higher rate than their counterparts in other developed nations, with penal confinement being "commonplace for poor men of working age". Some scholars contend that the shift to neoliberal social and economic policies starting in the late 1970s has expanded the penal state, retrenched the social welfare state, deregulated the economy and criminalized poverty, ultimately "transforming what it means to be poor in America". 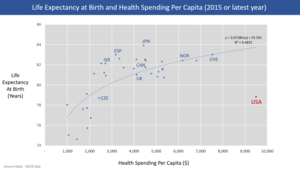 Chart showing life expectancy at birth and health care spending per capita for OECD countries as of 2013. 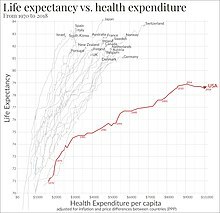 The U.S. is an outlier, with much higher spending but below average life expectancy. The American system is a mix of public and private insurance. 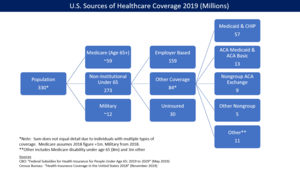 The government provides insurance coverage for approximately 53 million elderly via Medicare, 62 million lower-income persons via Medicaid, and 15 million military veterans via the Veteran's Administration. About 178 million employed by companies receive subsidized health insurance through their employer, while 52 million other persons directly purchase insurance either via the subsidized marketplace exchanges developed as part of the Affordable Care Act or directly from insurers. The private sector delivers healthcare services, with the exception of the Veteran's Administration, where doctors are employed by the government. 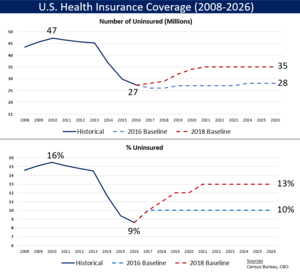 Multiple surveys indicate the number of uninsured fell between 2013–2016 due to expanded Medicaid eligibility and health insurance exchanges established due to the Patient Protection and Affordable Care Act, also known as the "ACA" or "Obamacare". According to the United States Census Bureau, in 2012 there were 45.6 million people in the US (14.8% of the under-65 population) who were without health insurance. Following the implementation of major ACA provisions in 2013, this figure fell by 18.3 million or 40%, to 27.3 million by 2016 or 8.6% of the under-65 population. However, under President Trump these gains in healthcare coverage have begun to reverse. The Commonwealth Fund estimated in May 2018 that the number of uninsured increased by 4 million from early 2016 to early 2018. The rate of those uninsured increased from 12.7% in 2016 to 15.5%. The impact was greater among lower-income adults, who had a higher uninsured rate than higher-income adults. Regionally, the South and West had higher uninsured rates than the North and East. Further, those 18 states that have not expanded Medicaid had a higher uninsured rate than those that did. According to Physicians for a National Health Program, this lack of insurance causes roughly 48,000 unnecessary deaths per year. The group's methodology has been criticized by John C. Goodman for not looking at cause of death or tracking insurance status changes over time, including the time of death. A 2009 study by former Clinton policy adviser Richard Kronick found no increased mortality from being uninsured after certain risk factors were controlled for. The U.S. lags in overall healthcare performance but is a global leader in medical innovation. America solely developed or contributed significantly to 9 of the top 10 most important medical innovations since 1975 as ranked by a 2001 poll of physicians, while the EU and Switzerland together contributed to five. Since 1966, Americans have received more Nobel Prizes in Medicine than the rest of the world combined. From 1989 to 2002, four times more money was invested in private biotechnology companies in America than in Europe. Of 17 high-income countries studied by the National Institutes of Health in 2013, the United States ranked at or near the top in obesity rate, frequency of automobile use and accidents, homicides, infant mortality rate, incidence of heart and lung disease, sexually transmitted infections, adolescent pregnancies, recreational drug or alcohol deaths, injuries, and rates of disability. Together, such lifestyle and societal factors place the U.S. at the bottom of that list for life expectancy. On average, a U.S. male can be expected to live almost four fewer years than those in the top-ranked country, though Americans who reach age 75 live longer than those who reach that age in peer nations. A comprehensive 2007 study by European doctors found the five-year cancer survival rate was significantly higher in the U.S. than in all 21 European nations studied, 66.3% for men versus the European mean of 47.3% and 62.9% versus 52.8% for women. Americans undergo cancer screenings at significantly higher rates than people in other developed countries, and access MRI and CT scans at the highest rate of any OECD nation. People in the U.S. diagnosed with high cholesterol or hypertension access pharmaceutical treatments at higher rates than those diagnosed in other developed nations, and are more likely to successfully control the conditions. Diabetics are more likely to receive treatment and meet treatment targets in the U.S. than in Canada, England, or Scotland. According to a 2018 study of 2016 data by the Institute for Health Metrics and Evaluation, the U.S. was ranked 27th in the world for healthcare and education, down from 6th in 1990. 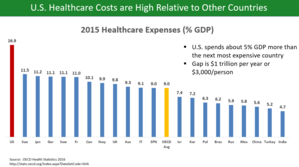 U.S. healthcare costs are considerably higher than other countries as a share of GDP, among other measures. According to the OECD, U.S. healthcare costs in 2015 were 16.9% GDP, over 5% GDP higher than the next most expensive OECD country. A gap of 5% GDP represents $1 trillion, about $3,000 per person or one-third higher relative to the next most expensive country. The high cost of health care in the United States is attributed variously to technological advance, administration costs, drug pricing, suppliers charging more for medical equipment, the receiving of more medical care than people in other countries, the high wages of doctors, government regulations, the impact of lawsuits, and third party payment systems insulating consumers from the full cost of treatments. The lowest prices for pharmaceuticals, medical devices, and payments to physicians are in government plans. Americans tend to receive more medical care than people do in other countries, which is a notable contributor to higher costs. In the United States, a person is more likely to receive open heart surgery after a heart attack than in other countries. Medicaid pays less than Medicare for many prescription drugs due to the fact Medicaid discounts are set by law, whereas Medicare prices are negotiated by private insurers and drug companies. Government plans often pay less than overhead, resulting in healthcare providers shifting the cost to the privately insured through higher prices. The United States is the world's second-largest manufacturer, with a 2013 industrial output of US$2.4 trillion. Its manufacturing output is greater than of Germany, France, India, and Brazil combined. Its main industries include petroleum, steel, automobiles, construction machinery, aerospace, agricultural machinery, telecommunications, chemicals, electronics, food processing, consumer goods, lumber, and mining. The U.S. leads the world in airplane manufacturing, which represents a large portion of U.S. industrial output. 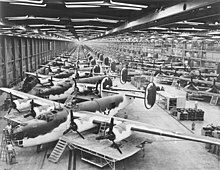 American companies such as Boeing, Cessna (see: Textron), Lockheed Martin (see: Skunk Works), and General Dynamics produce a majority of the world's civilian and military aircraft in factories across the United States. The manufacturing sector of the U.S. economy has experienced substantial job losses over the past several years. In January 2004, the number of such jobs stood at 14.3 million, down by 3.0 million jobs, or 17.5 percent, since July 2000 and about 5.2 million since the historical peak in 1979. Employment in manufacturing was its lowest since July 1950. The number of steel workers fell from 500,000 in 1980 to 224,000 in 2000. Statistics released by the U.S. Census Bureau showed that, in 2008, the number of business 'deaths' began overtaking the number of business 'births' and that the trend continued at least through 2012. The U.S. produces approximately 18% of the world's manufacturing output, a share that has declined as other nations developed competitive manufacturing industries. The job loss during this continual volume growth is the result of multiple factors including increased productivity, trade, and secular economic trends. In addition, growth in telecommunications, pharmaceuticals, aircraft, heavy machinery and other industries along with declines in low end, low skill industries such as clothing, toys, and other simple manufacturing have resulted in some U.S. jobs being more highly skilled and better paying. There has been much debate within the United States on whether the decline in manufacturing jobs are related to American unions, lower foreign wages, or both. Products include wheat, corn, other grains, fruits, vegetables, cotton; beef, pork, poultry, dairy products, forest products, and fish. The Interstate Highway System extends 46,876 miles (75,440 km). The Port of Houston, one of the largest ports in the United States. The U.S. economy is heavily dependent on road transport for moving people and goods. Personal transportation is dominated by automobiles, which operate on a network of 4 million miles (6.4 million km) of public roads, including one of the world's longest highway systems at 57,000 miles (91,700 km). The world's second-largest automobile market, the United States has the highest rate of per-capita vehicle ownership in the world, with 765 vehicles per 1,000 Americans. About 40% of personal vehicles are vans, SUVs, or light trucks. Mass transit accounts for 9% of total U.S. work trips. Transport of goods by rail is extensive, though relatively low numbers of passengers (approximately 31 million annually) use intercity rail to travel, partially due to the low population density throughout much of the nation. However, ridership on Amtrak, the national intercity passenger rail system, grew by almost 37% between 2000 and 2010. Also, light rail development has increased in recent years. The state of California is currently constructing the nation's first high-speed rail system. The civil airline industry is entirely privately-owned and has been largely deregulated since 1978, while most major airports are publicly-owned. The three largest airlines in the world by passengers carried are U.S.-based; American Airlines is number one after its 2013 acquisition by U.S. Airways. Of the world's 30 busiest passenger airports, 12 of them are in the United States, including the busiest, Hartsfield–Jackson Atlanta International Airport. Countries by natural gas proven reserves (2014). The U.S. holds the world's fourth largest natural gas reserves. The US is the second-largest energy consumer in total use. The U.S. ranks seventh in energy consumption per capita after Canada and a number of other countries. The majority of this energy is derived from fossil fuels: in 2005, it was estimated that 40% of the nation's energy came from petroleum, 23% from coal, and 23% from natural gas. Nuclear power supplied 8.4% and renewable energy supplied 6.8%, which was mainly from hydroelectric dams although other renewables are included. American dependence on oil imports grew from 24% in 1970 to 65% by the end of 2005. Transportation has the highest consumption rates, accounting for approximately 69% of the oil used in the United States in 2006, and 55% of oil use worldwide as documented in the Hirsch report. In 2013, the United States imported 2,808 million barrels of crude oil, compared to 3,377 million barrels in 2010. While the U.S. is the largest importer of fuel, The Wall Street Journal reported in 2011 that the country was about to become a net fuel exporter for the first time in 62 years. The paper reported expectations that this would continue until 2020. In fact, petroleum was the major export from the country in 2011. Internet was developed in the U.S. and the country hosts many of the world's largest hubs. Protectionist measures since 2008 by country. The United States is the world's second-largest trading nation. There is a large amount of U.S. dollars in circulation all around the planet; about 60% of funds used in international trade are U.S. dollars. The dollar is also used as the standard unit of currency in international markets for commodities such as gold and petroleum. The North American Free Trade Agreement, or NAFTA, created one of the largest trade blocs in the world in 1994. Since 1976, the U.S. has sustained merchandise trade deficits with other nations, and since 1982, current account deficits. The nation's long-standing surplus in its trade in services was maintained, however, and reached a record US$231 billion in 2013. The U.S. trade deficit increased from $502 billion in 2016 to $552 billion in 2017, an increase of $50 billion or 10%. During 2017, total imports were $2.90 trillion, while exports were $2.35 trillion. The net deficit in goods was $807 billion, while the net surplus in services was $255 billion. Americas ten largest trading partners are China, Canada, Mexico, Japan, Germany, South Korea, United Kingdom, France, India and Taiwan. The goods trade deficit with China rose from $347 billion in 2016 to $376 billion in 2017, an increase of $30 billion or 8%. In 2017, the U.S. had a goods trade deficit of $71 billion with Mexico and $17 billion with Canada. According to the KOF Index of Globalization and the Globalization Index by A.T. Kearney/Foreign Policy Magazine, the U.S. has a relatively high degree of globalization. U.S. workers send a third of all remittances in the world. U.S. household and non-profit net worth exceeded $100 trillion for the first time in Q1 2018; it has been setting records since Q4 2012. The U.S. federal government or "national debt" was $21.1 trillion in May 2018, just over 100% GDP. Using a subset of the national debt called "debt held by the public", U.S. debt was approximately 77% GDP in 2017. By this measure, the U.S. ranked 43rd highest among 2017 nations. Debt held by the public rose considerably as a result of the Great Recession and its aftermath. It is expected to continue rising as the country ages towards 100% GDP by 2028. The U.S. public debt was $909 billion in 1980, an amount equal to 33% of America's gross domestic product (GDP); by 1990, that number had more than tripled to $3.2 trillion—or 56% of GDP. In 2001 the national debt was $5.7 trillion; however, the debt-to-GDP ratio remained at 1990 levels. Debt levels rose quickly in the following decade, and on January 28, 2010, the U.S. debt ceiling was raised to $14.3 trillion. Based on the 2010 United States federal budget, total national debt will grow to nearly 100% of GDP, versus a level of approximately 80% in early 2009. The White House estimates that the government's tab for servicing the debt will exceed $700 billion a year in 2019, up from $202 billion in 2009. The U.S. Treasury statistics indicate that, at the end of 2006, non-US citizens and institutions held 44% of federal debt held by the public. As of 2014[update], China, holding $1.26 trillion in treasury bonds, is the largest foreign financier of the U.S. public debt. The overall financial position of the United States as of 2014 includes $269.6 trillion of assets owned by households, businesses, and governments within its borders, representing more than 15.7 times the annual gross domestic product of the United States. Debts owed during this same period amounted to $145.8 trillion, about 8.5 times the annual gross domestic product. Since 2010, the U.S. Treasury has been obtaining negative real interest rates on government debt. Such low rates, outpaced by the inflation rate, occur when the market believes that there are no alternatives with sufficiently low risk, or when popular institutional investments such as insurance companies, pensions, or bond, money market, and balanced mutual funds are required or choose to invest sufficiently large sums in Treasury securities to hedge against risk. Lawrence Summers and others state that at such low rates, government debt borrowing saves taxpayer money, and improves creditworthiness. In the late 1940s through the early 1970s, the US and UK both reduced their debt burden by about 30% to 40% of GDP per decade by taking advantage of negative real interest rates, but there is no guarantee that government debt rates will continue to stay so low. In January 2012, the U.S. Treasury Borrowing Advisory Committee of the Securities Industry and Financial Markets Association unanimously recommended that government debt be allowed to auction even lower, at negative absolute interest rates. The United States dollar is the unit of currency of the United States. The U.S. dollar is the currency most used in international transactions. Several countries use it as their official currency, and in many others it is the de facto currency. The federal government attempts to use both monetary policy (control of the money supply through mechanisms such as changes in interest rates) and fiscal policy (taxes and spending) to maintain low inflation, high economic growth, and low unemployment. A private central bank, known as the Federal Reserve, was formed in 1913 to provide a stable currency and monetary policy. The U.S. dollar has been regarded as one of the more stable currencies in the world and many nations back their own currency with U.S. dollar reserves. The U.S. dollar has maintained its position as the world's primary reserve currency, although it is gradually being challenged in that role. Almost two thirds of currency reserves held around the world are held in U.S. dollars, compared to around 25% for the next most popular currency, the euro. Rising U.S. national debt and quantitative easing has caused some to predict that the U.S. dollar will lose its status as the world's reserve currency; however, these predictions have not come to fruition. The United States ranked 4th in the ease of doing business index in 2012, 18th in the Economic Freedom of the World index by the Fraser Institute in 2012, 10th in the Index of Economic Freedom by The Wall Street Journal and The Heritage Foundation in 2012, 15th in the 2014 Global Enabling Trade Report, and 3rd on the Global Competitiveness Report. According to the 2014 Index of Economic Freedom, released by The Wall Street Journal and The Heritage Foundation, the U.S. has dropped out of the top 10 most economically free countries. The U.S. has been on a steady seven-year economic freedom decline and is the only country to do so. The index measures each nation's commitment to free enterprise on a scale of 0 to 100. Countries losing economic freedom and receiving low index scores are at risk of economic stagnation, high unemployment rates, and diminishing social conditions. The 2014 Index of Economic Freedom gave the United States a score of 75.5 and is listed as the twelfth-freest economy in world. It dropped two rankings and its score is half a point lower than in 2013. Number of countries having a banking crisis in each year since 1800. This is based on This Time is Different: Eight Centuries of Financial Folly  which covers only 70 countries. The general upward trend might be attributed to many factors. One of these is a gradual increase in the percent of people who receive money for their labor. The dramatic feature of this graph is the virtual absence of banking crises during the period of the Bretton Woods agreement, 1945 to 1971. This analysis is similar to Figure 10.1 in Reinhart and Rogoff (2009). For more details see the help file for "bankingCrises" in the Ecdat package available from the Comprehensive R Archive Network (CRAN). Some efforts seek, either directly or indirectly, to control prices. Traditionally, the government has sought to create state-regulated monopolies such as electric utilities from while allowing prices in the level that would ensure them normal profits. At times, the government has extended economic control to other kinds of industries as well. In the years following the Great Depression, it devised a complex system to stabilize prices for agricultural goods, which tend to fluctuate wildly in response to rapidly changing supply and demand. A number of other industries—trucking and, later, airlines—successfully sought regulation themselves to limit what they considered as harmful price-cutting, a process called regulatory capture. Another form of economic regulation, antitrust law, seeks to strengthen market forces so that direct regulation is unnecessary. The government—and, sometimes, private parties—have used antitrust law to prohibit practices or mergers that would unduly limit competition. Bank regulation in the United States is highly fragmented compared to other G10 countries where most countries have only one bank regulator. In the U.S., banking is regulated at both the federal and state level. The U.S. also has one of the most highly regulated banking environments in the world; however, many of the regulations are not soundness related, but are instead focused on privacy, disclosure, fraud prevention, anti-money laundering, anti-terrorism, anti-usury lending, and promoting lending to lower-income segments. Since the 1970s, government has also exercised control over private companies to achieve social goals, such as improving the public's health and safety or maintaining a healthy environment. For example, the Occupational Safety and Health Administration provides and enforces standards for workplace safety, and the United States Environmental Protection Agency provides standards and regulations to maintain air, water, and land resources. The U.S. Food and Drug Administration regulates what drugs may reach the market, and also provides standards of disclosure for food products. American attitudes about regulation changed substantially during the final three decades of the 20th century. Beginning in the 1970s, policy makers grew increasingly convinced that economic regulation protected companies at the expense of consumers in industries such as airlines and trucking. At the same time, technological changes spawned new competitors in some industries, such as telecommunications, that once were considered natural monopolies. Both developments led to a succession of laws easing regulation. While leaders of America's two most influential political parties generally favored economic deregulation during the 1970s, 1980s, and 1990s, there was less agreement concerning regulations designed to achieve social goals. Social regulation had assumed growing importance in the years following the Depression and World War II, and again in the 1960s and 1970s. During the 1980s, the government relaxed labor, consumer and environmental rules based on the idea that such regulation interfered with free enterprise, increased the costs of doing business, and thus contributed to inflation. The response to such changes is mixed; many Americans continued to voice concerns about specific events or trends, prompting the government to issue new regulations in some areas, including environmental protection. Where legislative channels have been unresponsive, some citizens have turned to the courts to address social issues more quickly. For instance, in the 1990s, individuals, and eventually the government itself, sued tobacco companies over the health risks of cigarette smoking. The 1998 Tobacco Master Settlement Agreement provided states with long-term payments to cover medical costs to treat smoking-related illnesses. Between 2000 and 2008, economic regulation in the United States saw the most rapid expansion since the early 1970s. The number of new pages in the Federal Registry, a proxy for economic regulation, rose from 64,438 new pages in 2001 to 78,090 in new pages in 2007, a record amount of regulation. Economically significant regulations, defined as regulations which cost more than $100 million a year, increased by 70%. Spending on regulation increased by 62% from $26.4 billion to $42.7 billion. Taxation in the United States is a complex system which may involve payment to at least four different levels of government and many methods of taxation. Taxes are levied by the federal government, by the state governments, and often by local governments, which may include counties, municipalities, township, school districts, and other special-purpose districts, which include fire, utility, and transit districts. Forms of taxation include taxes on income, property, sales, imports, payroll, estates and gifts, as well as various fees. When taxation by all government levels taken into consideration, the total taxation as percentage of GDP was approximately a quarter of GDP in 2011. Share of black market in the U.S. economy is very low compared to other countries. Although a federal wealth tax is prohibited by the United States Constitution unless the receipts are distributed to the States by their populations, state and local government property tax amount to a wealth tax on real estate, and because capital gains are taxed on nominal instead of inflation-adjusted profits, the capital gains tax amounts to a wealth tax on the inflation rate. U.S. taxation is generally progressive, especially at the federal level, and is among the most progressive in the developed world. There is debate over whether taxes should be more or less progressive. CBO: U.S. Federal spending and revenue components for fiscal year 2017. Major expenditure categories are healthcare, Social Security, and defense; income and payroll taxes are the primary revenue sources. 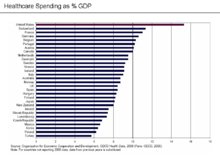 The United States public-sector spending amounts to about 30% of GDP (federal is around 21%, state and local the remainder). Each level of government provides many direct services. The federal government, for example, is responsible for national defense, research that often leads to the development of new products, conducts space exploration, and runs numerous programs designed to help workers develop workplace skills and find jobs (including higher education). Government spending has a significant effect on local and regional economies—and on the overall pace of economic activity. State governments, meanwhile, are responsible for the construction and maintenance of most highways. State, county, or city governments play the leading role in financing and operating public schools. Local governments are primarily responsible for police and fire protection. The welfare system in the United States began in the 1930s, during the Great Depression, with the passage of the New Deal. The welfare system was later expanded in the 1960s through Great Society legislation, which included Medicare, Medicaid, the Older Americans Act and federal education funding. Overall, federal, state, and local spending accounted for almost 28% of gross domestic product in 1998. During FY2017, the federal government spent $3.98 trillion on a budget or cash basis, up $128 billion or 3.3% vs. FY2016 spending of $3.85 trillion. Major categories of FY 2017 spending included: Healthcare such as Medicare and Medicaid ($1,077B or 27% of spending), Social Security ($939B or 24%), non-defense discretionary spending used to run federal Departments and Agencies ($610B or 15%), Defense Department ($590B or 15%), and interest ($263B or 7%). During FY2017, the federal government collected approximately $3.32 trillion in tax revenue, up $48 billion or 1.5% versus FY2016. Primary receipt categories included individual income taxes ($1,587B or 48% of total receipts), Social Security/Social Insurance taxes ($1,162B or 35%), and corporate taxes ($297B or 9%). Other revenue types included excise, estate and gift taxes. FY 2017 revenues were 17.3% of gross domestic product (GDP), versus 17.7% in FY 2016. Tax revenues averaged approximately 17.4% GDP over the 1980–2017 period. The federal budget deficit (i.e., expenses greater than revenues) was $665 billion in FY2017, versus $585 billion in 2016, an increase of $80 billion or 14%. The budget deficit was 3.5% GDP in 2017, versus 3.2% GDP in 2016. 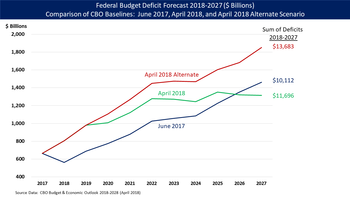 The budget deficit is forecast to rise to $804 billion in FY 2018, due significantly to the Tax Cuts and Jobs Act and other spending bills. An aging country and healthcare inflation are other drivers of deficits and debt over the long-run. Debt held by the public, a measure of national debt, was approximately $14.7 trillion or 77% of GDP in 2017, ranked the 43rd highest out of 207 countries. This debt, as a percent of GDP, is roughly equivalent to those of many western European nations. A central feature of the U.S. economy is the economic freedom afforded to the private sector by allowing the private sector to make the majority of economic decisions in determining the direction and scale of what the U.S. economy produces. This is enhanced by relatively low levels of regulation and government involvement, as well as a court system that generally protects property rights and enforces contracts. Today, the United States is home to 29.6 million small businesses, 30% of the world's millionaires, 40% of the world's billionaires, as well as 139 of the world's 500 largest companies. From its emergence as an independent nation, the United States has encouraged science and innovation. 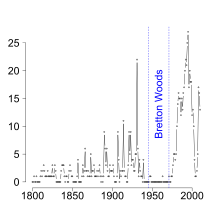 In the early 20th century, the research developed through informal cooperation between U.S. industry and academia grew rapidly and by the late 1930s exceeded the size of that taking place in Britain (although the quality of U.S. research was not yet on par with British and German research at the time). After World War II, federal spending on defense R&D and antitrust policy played a significant role in U.S. innovation. The United States is rich in mineral resources and fertile farm soil, and it is fortunate to have a moderate climate. It also has extensive coastlines on both the Atlantic and Pacific Oceans, as well as on the Gulf of Mexico. Rivers flow from far within the continent and the Great Lakes—five large, inland lakes along the U.S. border with Canada—provide additional shipping access. These extensive waterways have helped shape the country's economic growth over the years and helped bind America's 50 individual states together in a single economic unit. The number of workers and, more importantly, their productivity help determine the health of the U.S. economy. Consumer spending in the U.S. rose to about 62% of GDP in 1960, where it stayed until about 1981, and has since risen to 71% in 2013. Throughout its history, the United States has experienced steady growth in the labor force, a phenomenon that is both cause and effect of almost constant economic expansion. Until shortly after World War I, most workers were immigrants from Europe, their immediate descendants, or African Americans who were mostly slaves taken from Africa, or their descendants. Beginning in the late 20th century, many Latin Americans immigrated, followed by large numbers of Asians after the removal of nation-origin based immigration quotas. The promise of high wages brings many highly skilled workers from around the world to the United States, as well as millions of illegal immigrants seeking work in the informal economy. Over 13 million people officially entered the United States during the 1990s alone. Labor mobility has also been important to the capacity of the American economy to adapt to changing conditions. When immigrants flooded labor markets on the East Coast, many workers moved inland, often to farmland waiting to be tilled. Similarly, economic opportunities in industrial, northern cities attracted black Americans from southern farms in the first half of the 20th century, in what was known as the Great Migration. In the United States, the corporation has emerged as an association of owners, known as stockholders, who form a business enterprise governed by a complex set of rules and customs. Brought on by the process of mass production, corporations, such as General Electric, have been instrumental in shaping the United States. Through the stock market, American banks and investors have grown their economy by investing and withdrawing capital from profitable corporations. Today in the era of globalization, American investors and corporations have influence all over the world. The American government is also included among the major investors in the American economy. Government investments have been directed towards public works of scale (such as from the Hoover Dam), military-industrial contracts, and the financial industry. The United States has been a leader in technological innovation since the late 19th century and scientific research since the mid-20th century. In 1876, Alexander Graham Bell was awarded the first U.S. patent for the telephone. Thomas Edison's laboratory developed the phonograph, the first long-lasting light bulb, and the first viable movie camera. Nikola Tesla pioneered the AC induction motor and high frequency power transmission used in radio. In the early 20th century, the automobile companies of Ransom E. Olds and Henry Ford popularized the assembly line. The Wright brothers, in 1903, made the first sustained and controlled heavier-than-air powered flight. 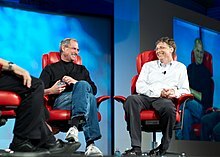 Steve Jobs and Bill Gates are two of the best-known American entrepreneurs. American society highly emphasizes entrepreneurship and business. Entrepreneurship is the act of being an entrepreneur, which can be defined as "one who undertakes innovations, finance and business acumen in an effort to transform innovations into economic goods". This may result in new organizations or may be part of revitalizing mature organizations in response to a perceived opportunity. The most obvious form of entrepreneurship refers to the process and engagement of starting new businesses (referred to as startup companies); however, in recent years, the term has been extended to include social and political forms of entrepreneurial activity. When entrepreneurship is describing activities within a firm or large organization it is referred to as intra-preneurship and may include corporate venturing, when large entities spin-off organizations. According to Paul Reynolds, entrepreneurship scholar and creator of the Global Entrepreneurship Monitor, "by the time they reach their retirement years, half of all working men in the United States probably have a period of self-employment of one or more years; one in four may have engaged in self-employment for six or more years. Participating in a new business creation is a common activity among U.S. workers over the course of their careers." And in recent years, business creation has been documented by scholars such as David Audretsch to be a major driver of economic growth in both the United States and Western Europe. Venture capital, as an industry, originated in the United States, which it still dominates. According to the National Venture Capital Association 11% of private sector jobs come from venture capital backed companies and venture capital backed revenue accounts for 21% of U.S. GDP. Total U.S. investment in venture capital amounted to US$48.3 billion in 2014, for 4 356 deals. This represented 'an increase of 61% in dollars and a 4% increase in deals over the prior year,' reported the National Venture Capital Association. The Organisation for Economic Cooperation and Development estimates that venture capital investment in the United States had fully recovered by 2014 to pre-recession levels. The National Venture Capital Association has reported that, in 2014, venture capital investment in the life sciences was at its highest level since 2008: in biotechnology, $6.0 billion was invested in 470 deals and, in life sciences overall, $8.6 billion in 789 deals (including biotechnology and medical devices). Two thirds (68%) of the investment in biotechnology went to first-time/early-stage development deals and the remainder to the expansion stage of development (14%), seed-stage companies (11%) and late-stage companies (7%). However, it was the software industry which invested in the greatest number of deals overall: 1,799, for an investment of $19.8 billion. Second came internet-specific companies, garnering US$11.9 billion in investment through 1,005 deals. Many of these companies are based in the state of California, which alone concentrates 28% of U.S. research. Americans are "venturesome consumers" who are unusually willing to try new products of all sorts, and to pester manufacturers to improve their products. Since 1985 there have been three major waves of M&A in the U.S. (see graph "Mergers and Acquisitions in the U.S. since 1985"). 2017 has been the most active year in terms of number of deals (12,914), whereas 2015 cumulated to the biggest overall value of deals (24 billion USD). The biggest merger deal in U.S. history was the acquisition of Time Warner by America Online Inc. in 2000, where the bid was over 164 billion USD. Since 2000 acquisitions of U.S. companies by Chinese investors increased by 368%. The other way round—US companies acquiring Chinese Companies—showed a decrease of 25%, with a short upwards trend until 2007. The United States of America invests more funds in research and development (R&D) in absolute terms than the other G7 nations combined: 17.2% more in 2012. Since 2000, gross domestic expenditure on R&D (GERD) in the USA has increased by 31.2%, enabling it to maintain its share of GERD among the G7 nations at 54.0% (54.2% in 2000). Generally speaking, U.S. investment in R&D rose with the economy in the first years of the century before receding slightly during the economic recession then rising again as growth resumed. At its peak in 2009, GERD amounted to US$ 406 billion (2.82% of GDP). Despite the recession, it was still at 2.79% in 2012 and will slide only marginally to 2.73% in 2013, according to provisional data, and should remain at a similar level in 2014. The federal government is the primary funder of basic research, at 52.6% in 2012; state governments, universities and other non-profits funded 26%. Experimental development, on the other hand, is primarily funded by industry: 76.4% to the federal government's 22.1% in 2012. While U.S. investment in R&D is high, it failed to reach President Obama's target of 3% of GDP by the end of his presidency in 2016. American supremacy is eroding in this respect, even as other nations—China, in particular—are carrying their own investment in R&D to new heights. Between 2009 and 2012, the United States' world share of research expenditure receded slightly from 30.5% to 28.1%. Several countries now devote more than 4% of GDP to R&D (Israel, Japan and the Republic of Korea) and others plan to raise their own GERD/GDP ratio to 4% by 2020 (Finland and Sweden). Business enterprises contributed 59.1 % of U.S. GERD in 2012, down from 69.0 % in 2000. Private non-profits and foreign entities each contribute a small fraction of total R&D, 3.3% and 3.8%, respectively. The USA has historically been a leader in business R&D and innovation. The economic recession of 2008–2009 has had a lasting impact, however. While the major performers of R&D largely maintained their commitments, the pain of the U.S. recession was felt mainly by small businesses and start-ups. Statistics released by the U.S. Census Bureau showed that, in 2008, the number of business 'deaths' began overtaking the number of business 'births' and that the trend continued at least through 2012. From 2003 to 2008, business research spending had followed a generally upward trajectory. In 2009, the curve inverted, as expenditure fell by 4% over the previous year then again in 2010, albeit by 1–2% this time. Companies in high-opportunity industries like health care cut back less than those in more mature industries, such as fossil fuels. The largest cutbacks in R&D spending were in agriculture production: −3.5% compared to the average R&D to net sales ratio. The chemicals and allied products industry and electronic equipment industry, on the other hand, showed R&D to net sales ratios that were 3.8% and 4.8% higher than average. Although the amount of R&D spending increased in 2011, it was still below the level of 2008 expenditure. By 2012, the growth rate of business-funded R&D had recovered. Whether this continues will be contingent on the pursuit of economic recovery and growth, levels of federal research funding and the general business climate. The level of research spending varies considerably from one state to another. Six states (New Mexico, Maryland, Massachusetts, Washington, California and Michigan) each devoted 3.9% or more of their GDP to R&D in 2010, together contributing 42% of national research expenditure. In 2010, more than one quarter of R&D was concentrated in California (28.1%), ahead of Massachusetts (5.7%), New Jersey (5.6%), Washington State (5.5%), Michigan (5.4%), Texas (5.2%), Illinois (4.8%), New York (3.6%) and Pennsylvania (3.5%). Seven states (Arkansas, Nevada, Oklahoma, Louisiana, South Dakota and Wyoming) devoted less than 0.8% of GDP to R&D. California is home to Silicon Valley, the name given to the area hosting the leading corporations and start-ups in information technology. This state also hosts dynamic biotechnology clusters in the San Francisco Bay Area, Los Angeles and San Diego. The main biotechnology clusters outside California are the cities of Boston/Cambridge, Massachusetts, Maryland, suburban Washington, DC, New York, Seattle, Philadelphia, and Chicago. California supplies 13.7% of all jobs in science and engineering across the country, more than any other state. Some 5.7% of Californians are employed in these fields. This high share reflects a potent combination of academic excellence and a strong business focus on R&D: the prestigious Stanford University and University of California rub shoulders with Silicon Valley, for instance. In much the same way, Route 128 around Boston in the state of Massachusetts is not only home to numerous high-tech firms and corporations but also hosts the renowned Harvard University and Massachusetts Institute of Technology. New Mexico's high research intensity can be explained by the fact that it hosts the Los Alamos National Laboratory. Maryland's position may reflect the concentration of federally funded research institutions there. Washington State has a high concentration of high-tech firms like Microsoft, Amazon and Boeing and the engineering functions of most automobile manufacturers are located in the state of Michigan. The federal government and most of the 50 states that make up the United States offer tax credits to particular industries and companies to encourage them to engage in research and development (R&D). Congress usually renews a tax credit every few years. According to a survey by The Wall Street Journal in 2012, companies do not factor in these credits when making decisions about investing in R&D, since they cannot rely on these credits being renewed. In 2014, four U.S. multinational corporations figured in the Top 50 for the volume of expenditure on R&D: Microsoft, Intel, Johnson & Johnson and Google. Several have figured in the Top 20 for at least ten years: Intel, Microsoft, Johnson & Johnson, Pfizer and IBM. Google was included in this table for the first time in 2013. Global top 50 companies by R&D volume and intensity, 2014 * R&D intensity is defined as R&D expenditure divided by net sales. ** Although incorporated in the Netherlands, Airbus's principal manufacturing facilities are located in France, Germany, Spain and the UK. Source: UNESCO Science Report: towards 2030 (2015), Table 9.3, based on Hernández et. al (2014) EU R&D Scoreboard: the 2014 EU Industrial R&D Investment Scoreboard. European Commission: Brussels, Table 2.2. The United States has lost its world leadership for high-tech goods. Even computing and communications equipment is now assembled in China and other emerging economies, with high-tech value-added components being produced elsewhere. Until 2010, the United States was a net exporter of pharmaceuticals but, since 2011, it has become a net importer of these goods. The United States is a post-industrial country. Imports of high-tech products far exceed exports. However, the United States' technologically skilled workforce produces a large volume of patents and can still profit from the license or sale of these patents. Within the United States' scientific industries active in research, 9.1% of products and services are concerned with the licensing of intellectual property rights. When it comes to trade in intellectual property, the United States remains unrivalled. Income from royalties and licensing amounted to $129.2 billion in 2013, the highest in the world. Japan comes a distant second, with receipts of $31.6 billion in 2013. The United States' payments for use of intellectual property amounted to $39.0 billion in 2013, exceeded only by Ireland ($46.4 billion). A typical Walmart discount department store (location: Laredo, Texas). 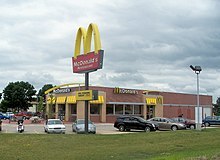 In 2011, the 20 largest U.S.-based companies by revenue were Walmart, ExxonMobil, Chevron, ConocoPhillips, Fannie Mae, General Electric, Berkshire Hathaway, General Motors, Ford Motor Company, Hewlett-Packard, AT&T, Cargill, McKesson Corporation, Bank of America, Federal Home Loan Mortgage Corporation, Apple Inc., Verizon, JPMorgan Chase, and Cardinal Health. In 2013, eight of the world's ten largest companies by market capitalization were American: Apple Inc., ExxonMobil, Berkshire Hathaway, Walmart, General Electric, Microsoft, IBM, and Chevron Corporation. According to Fortune Global 500 2011, the ten largest U.S. employers were Walmart, U.S. Postal Service, IBM, UPS, McDonald's, Target Corporation, Kroger, The Home Depot, General Electric, and Sears Holdings. Apple, Google, IBM, McDonald's, and Microsoft are the world's five most valuable brands in an index published by Millward Brown. A 2012 Deloitte report published in STORES magazine indicated that of the world's top 250 largest retailers by retail sales revenue in fiscal year 2010, 32% of those retailers were based in the United States, and those 32% accounted for 41% of the total retail sales revenue of the top 250. Amazon is the world's largest online retailer. 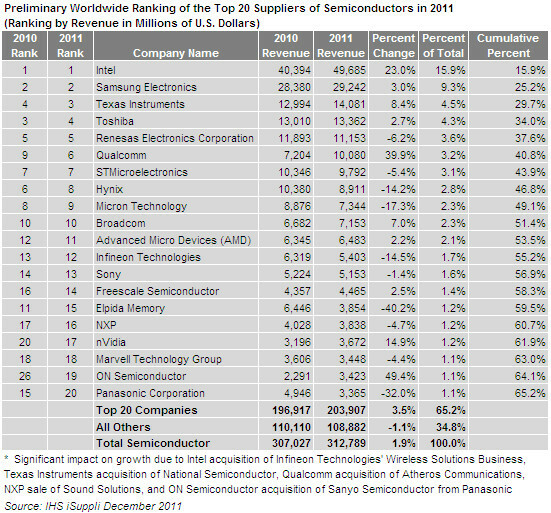 Half of the world's 20 largest semiconductor manufacturers by sales were American-origin in 2011. Most of the world's largest charitable foundations were founded by Americans. American producers create nearly all of the world's highest-grossing films. Many of the world's best-selling music artists are based in the United States. U.S. tourism sector welcomes approximately 60 million international visitors every year. In a recent study by Salam Standard, it has been reported that the United States is the biggest beneficiary of global Muslim tourism spend, enjoying 24 percent share of the total Muslim travel spend worldwide or almost $35 billion. The New York Stock Exchange is the largest stock exchange in the world. Measured by value of its listed companies' securities, the New York Stock Exchange is more than three times larger than any other stock exchange in the world. As of October 2008, the combined capitalization of all domestic NYSE listed companies was US$10.1 trillion. NASDAQ is another American stock exchange and the world's third-largest exchange after the New York Stock Exchange and Japan's Tokyo Stock Exchange. However, NASDAQ's trade value is larger than Japan's TSE. NASDAQ is the largest electronic screen-based equity securities trading market in the U.S. With approximately 3,800 companies and corporations, it has more trading volume per hour than any other stock exchange. Because of the influential role that the U.S. stock market plays in international finance, a New York University study in late 2014 interprets that in the short run, shocks that affect the willingness to bear risk independently of macroeconomic fundamentals explain most of the variation in the U.S. stock market. In the long run, the U.S. stock market is profoundly affected by shocks that reallocate the rewards of a given level of production between workers and shareholders. Productivity shocks, however, play a small role in historical stock market fluctuations at all horizons in the U.S. stock market. The U.S. finance industry comprised only 10% of total non-farm business profits in 1947, but it grew to 50% by 2010. Over the same period, finance industry income as a proportion of GDP rose from 2.5% to 7.5%, and the finance industry's proportion of all corporate income rose from 10% to 20%. The mean earnings per employee hour in finance relative to all other sectors has closely mirrored the share of total U.S. income earned by the top 1% income earners since 1930. The mean salary in New York City's finance industry rose from $80,000 in 1981 to $360,000 in 2011, while average New York City salaries rose from $40,000 to $70,000. In 1988, there were about 12,500 U.S. banks with less than $300 million in deposits, and about 900 with more deposits, but by 2012, there were only 4,200 banks with less than $300 million in deposits in the U.S., and over 1,800 with more. A 2012 International Monetary Fund study concluded that the U.S. financial sector has grown so large that it is slowing economic growth. New York University economist Thomas Philippon supported those findings, estimating that the U.S. spends $300 billion too much on financial services per year, and that the sector needs to shrink by 20%. Harvard University and University of Chicago economists agreed, calculating in 2014 that workers in research and development add $5 to the GDP for each dollar they earn, but finance industry workers cause the GDP to shrink by $0.60 for every dollar they are paid. A study by the Bank for International Settlements reached similar conclusions, saying the finance industry impedes economic growth and research and development based industries. US share of world GDP (%) since 1980. US share of world GDP (nominal) peaked in 1985 with 32.74% of global GDP (nominal). The second-highest share was 32.24% in 2001. US share of world GDP (PPP) peaked in 1999 with 23.78% of global GDP (PPP). The share has been declining each year since then. The Percentage of the U.S. working age population employed, 1995–2012. Real compensation per hour in the U.S. (1947–2018). Historical graph of real wages in the U.S. from 1964 to 2005. Productivity and real median family income growth, 1947–2009. United States historical inflation rate, 1666–2004. U.S. federal effective tax rates by income percentile and component as projected for 2014 by the Tax Policy Center. Development of U.S. federal government debt ceiling from 1990 to January 2012. 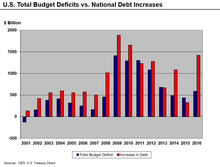 Deficit and debt increases 2001–2016. ^ "Gross Domestic Product, 3rd quarter 2018 (advance estimate)". BEA. Retrieved October 27, 2018. ^ "Report for Selected Countries and Subjects:United States". IMF. 2018. Retrieved October 9, 2018. ^ "Field Listing: GDP – Composition, by Sector of Origin". Central Intelligence Agency World Factbook. Central Intelligence Agency. Retrieved April 3, 2018. ^ "Consumer Price Index – September 2018" (PDF). Bureau of Labor Statistics. Bureau of Labor Statistics. ^ "Income and Poverty in the United States: 2017". U.S. Census Bureau. September 12, 2018. 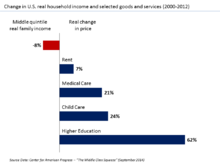 ^ "Household Income: 2015 (American Co)" (PDF). Census.gov. ^ "Graph: Civilian labor force (seasonally adjusted)". Data.bls.gov. Retrieved June 27, 2018. ^ "Employment Situation Summary". bls.gov. ^ "Labor Force Statistics from the Current Population Survey". Bureau of Labor Statistics. Retrieved July 5, 2014. 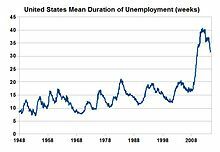 ^ "Unemployment Rate – Bureau of Labor Statistics Data". U.S. Bureau of Labor Statistics. May 7, 2018. Retrieved October 4, 2017. ^ "Usual Weekly Earnings of Wage and Salary Workers First Quarter 2017" (PDF). Bureau of Labor Statistics. U.S. Department of Labor. July 17, 2018. Retrieved September 13, 2018. ^ "Ease of Doing Business in United States". Doingbusiness.org. Retrieved November 21, 2017. ^ a b c d "United States – WTO Statistics Database". World Trade Organization. Retrieved March 1, 2017. ^ "Exports of goods by principal end-use category" (PDF). Census Bureau. ^ "Imports of goods by principal end-use category" (PDF). Census Bureau. ^ "Treasury TIC Data". U.S. Department of the Treasury. Retrieved July 9, 2017. 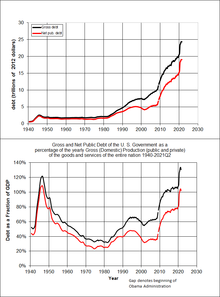 ^ "Public debt of United States". CIA World Factbook. 2017. Retrieved July 10, 2017. ^ a b "The Budget and Economic Outlook: 2017 to 2027". Congressional Budget Office. ^ "Development aid rises again in 2016 but flows to poorest countries dip". OECD. April 11, 2017. Retrieved September 25, 2017. ^ "Sovereigns rating list". Standard & Poor's. Archived from the original on June 18, 2011. Retrieved August 20, 2011. ^ a b Rogers, Simon; Sedghi, Ami (April 15, 2011). "How Fitch, Moody's and S&P rate each country's credit rating". The Guardian. London. Retrieved May 28, 2011. ^ "Scope affirms the USA's credit rating of AA with Stable Outlook". Scope Ratings. ^ "U.S. International Reserve Position". U.S. Department of Treasury. March 2, 2018. Retrieved March 2, 2018. ^ U.S. Economy – Basic Conditions & Resources. U.S. Diplomatic Mission to Germany. "The United States is said to have a mixed economy because privately owned businesses and government both play important roles". Accessed: October 24, 2011. ^ Outline of the U.S. Economy – How the U.S. Economy Works. U.S. Embassy Information Resource Center. "As a result, the American economy is perhaps better described as a "mixed" economy, with government playing an important role along with private enterprise. Although Americans often disagree about exactly where to draw the line between their beliefs in both free enterprise and government management, the mixed economy they have developed has been remarkably successful." Accessed: October 24, 2011. ^ "Report for Selected Country Groups and Subjects (PPP valuation of country GDP)". IMF. Retrieved December 29, 2017. ^ Some data refers to IMF staff estimates but some are actual figures for the year 2017, made in 12 April 2017. , International Monetary Fund. Accessed on 18 April 2017. ^ , International Monetary Fund. Database updated on 12 April 2017. Accessed on 21 April 2017. ^ a b "Public debt of United States". CIA World Factbook. 2018. Retrieved May 1, 2018. ^ a b "The Implementation of Monetary Policy – The Federal Reserve in the International Sphere" (PDF). Retrieved August 24, 2010. ^ Zaw Thiha Tun (July 29, 2015). "How Petrodollars Affect The U.S. Dollar". Retrieved October 14, 2016. ^ a b "Top Trading Partners". U.S. Census Bureau. December 2016. Retrieved July 8, 2017. ^ Wright, Gavin, and Jesse Czelusta, "Resource-Based Growth Past and Present", in Natural Resources: Neither Curse Nor Destiny, ed. Daniel Lederman and William Maloney (World Bank, 2007), p. 185. ISBN 0821365452. ^ Anthony, Craig (September 12, 2016). "10 Countries With The Most Natural Resources". Investopedia. ^ a b "Household Income". Society at a Glance 2014: OECD Social Indicators. OECD Publishing. March 18, 2014. doi:10.1787/soc_glance-2014-en. Retrieved May 29, 2014. ^ a b c "OECD Better Life Index". OECD. Retrieved November 25, 2012. ^ a b Digital History; Steven Mintz. "Digital History". Digitalhistory.uh.edu. Archived from the original on March 2, 2004. Retrieved April 21, 2012. ^ "United States remains the world's top producer of petroleum and natural gas hydrocarbons". EIA. ^ Vargo, Frank (March 11, 2011). "U.S. Manufacturing Remains World's Largest". Shopfloor. Retrieved March 28, 2012. ^ "UNCTADstat – Table view". unctadstat.unctad.org. ^ "Trade recovery expected in 2017 and 2018, amid policy uncertainty". Geneva, Switzerland: World Trade Organization. April 12, 2017. Retrieved June 22, 2017. ^ "Global 500 2016". Fortune. Number of companies data taken from the "Country" filter. ^ Table A – Market Capitalization of the World's Top Stock Exchanges (As at end of June 2012). Securities and Exchange Commission (China). ^ Adapting and evolving – Global venture capital insights and trends 2014. EY, 2014. ^ "United Nations Statistics Division – National Accounts Main Aggregates Database". ^ CIA World Factbook "Distribution of Family Income"
^ Gray, Sarah (June 4, 2018). "Trump Policies Highlighted in Scathing U.N. Report On U.S. Poverty". Fortune. Retrieved September 13, 2018. "The United States has the highest rate of income inequality among Western countries", the report states. ^ Baten, Jörg (2016). A History of the Global Economy. From 1500 to the Present. Cambridge University Press. p. 88ff. ISBN 978-1107507180. ^ W. J. Rorabaugh; Donald T. Critchlow; Paula C. Baker (2004). America's Promise: A Concise History of the United States. Rowman & Littlefield. p. 210. ISBN 978-0742511897. ^ Baten, Jörg (2016). A History of the Global Economy. From 1500 to the Present. Cambridge University Press. p. 95. ISBN 978-1107507180. ^ Baten, Jörg (2016). A History of the Global Economy. From 1500 to the Present. Cambridge University Press. p. 97f. ISBN 978-1107507180. ^ "Current Population Reports: Money Income of Households and Persons in the United States (1987)" (PDF). U.S. Department of Commerce. ^ "Current Population Reports: Income of nonfarm families and individuals (1946)" (PDF). U.S. Department of Commerce. ^ a b "Financial Crisis Inquiry Report-Conclusions-January 2011". Fcic.law.stanford.edu. March 10, 2011. Retrieved April 22, 2013. ^ "Report for Selected Countries and Subjects". www.imf.org. Retrieved September 23, 2018. ^ "Report for Selected Countries and Subjects". www.imf.org. Retrieved April 12, 2019. ^ "Federal Surplus or Deficit [-] as Percent of Gross Domestic Product". July 27, 2018. ^ a b Analysis, US Department of Commerce, BEA, Bureau of Economic. "Bureau of Economic Analysis". www.bea.gov. Retrieved May 7, 2018. ^ CIA World Factbook. "USA Economy". ^ "GDP growth (annual %)". Data.worldbank.org. Retrieved December 8, 2014. ^ "National Income and Product Accounts Gross Domestic Product: Second Quarter 2014 (Advance Estimate) Annual Revision: 1999 through First Quarter 2014". Bureau of Economic Analysis. Bureau of Economic Analysis. Retrieved July 31, 2014. ^ "UNCTADstat – Table view". unctadstat.unctad.org. Retrieved November 26, 2017. ^ "Report for Selected Countries and Subjects". www.imf.org. Retrieved November 26, 2017. ^ "The World Factbook — Central Intelligence Agency". www.cia.gov. Retrieved November 26, 2017. ^ CIA World Factbook. "United States. ^ a b c McFeatters, Dale (September 6, 2010). "Saluting 154 million in workforce on Labor Day". Napa Valley Register. ^ a b c d e f g "Office of Advocacy – Frequently Asked Questions – How important are small businesses to the U.S. economy?" (PDF). SBA.gov. Archived from the original (PDF) on December 2, 2010. Retrieved April 21, 2012. ^ "Obama: Small Business 'Heart' of Economy – YouTube". Youtube. Retrieved April 21, 2012. ^ "Global 500 2010: Global 500 1–100". CNN. ^ Walmart Corporate and Financial Facts. ^ "Minority population growing in the United States, census estimates show". Los Angeles Times. June 10, 2010. 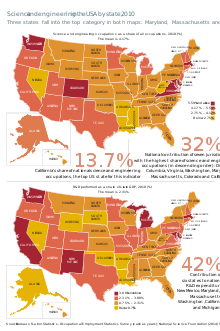 ^ Median Household Income for States: 2007 and 2008, September 2009, census.gov. ^ Keith Naughton, Lynn Doan and Jeffrey Green (February 20, 2015). As the Rich Get Richer, Unions Are Poised for Comeback. Bloomberg. ^ Michael Hiltzik (March 25, 2015). IMF agrees: Decline of union power has increased income inequality. Los Angeles Times. ^ "Doing Business in the United States (2006)". World Bank. Retrieved June 28, 2007. ^ Rebecca Ray, Milla Sanes, and John Schmitt (May 2013). No-Vacation Nation Revisited. Center for Economic and Policy Research. ^ Maxwell Strachan, Alissa Scheller, Jan Diehm (October 29, 2013). 15 Ways The United States Is The Best (At Being The Worst). The Huffington Post. ^ Ishaan Tharoor (May 20, 2014). MAP: The worst places in the world to be a worker. The Washington Post. see also: ITUC Global Rights Index. ^ "Federal Reserve Database-FRED-Data Series UNRATE". Research.stlouisfed.org. September 6, 2013. Retrieved October 20, 2013. ^ "Federal Reserve Database-FRED-Data Series Unemploy". Research.stlouisfed.org. Retrieved October 20, 2013. ^ "Federal Reserve Database-FRED-Data Series U6RATE-March 2013". Research.stlouisfed.org. September 6, 2013. Retrieved October 20, 2013. ^ "Federal Reserve Database-CLF160V Data Series". Research.stlouisfed.org. Retrieved October 20, 2013. ^ "FRED Database – POP Data Series – U.S. Population. November 2012". Research.stlouisfed.org. Retrieved October 20, 2013. ^ "Broader U-6 Unemployment Rate Increases to 17.1% in April". The Wall Street Journal. May 7, 2010. ^ Schwartz, Nelson (March 3, 2013). "Recovery in U.S. Is Lifting Profits, but Not Adding Jobs". The New York Times. Retrieved March 18, 2013. ^ "Chronic Unemployment in the Euro Area: Causes and Cures" (PDF). World Economic Outlook. International Monetary Fund. 1999. Retrieved August 22, 2013. ^ "Employment and Unemployment Among Youth Summary". United States Department of Labor. August 27, 2009. ^ "The Unemployment News Is Worse For Many". Forbes. June 7, 2013. ^ "The World Factbook (United States)". CIA.gov. September 25, 2013. Retrieved October 26, 2013. ^ "CPI Detailed Report – Data for February 2013" (PDF). Bureau of Labor Statistics. Retrieved June 1, 2014. ^ "Z.1: Financial Accounts of the United States" (PDF). Federal Reserve Board of Governors. March 6, 2014. Archived from the original (PDF) on May 27, 2014. Retrieved May 31, 2014. ^ David Leonhardt and Kevin Quealy (April 22, 2014). The American Middle Class Is No Longer the World's Richest. The New York Times. ^ CIA World Factbook. "Distribution of Family Income"
^ Saez, Emmanuel (June 30, 2016). 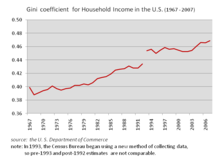 "Striking it Richer: The Evolution of Top Incomes in the United States". University of California, Berkeley. ^ Alvaredo, Facundo; Atkinson, Anthony B.; Piketty, Thomas; Saez, Emmanuel (2013). 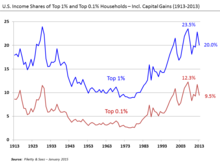 "The Top 1 Percent in International and Historical Perspective". Journal of Economic Perspectives. ^ Focus on Top Incomes and Taxation in OECD Countries: Was the crisis a game changer? OECD, May 2014. ^ Krugman, Paul (October 20, 2002). "For Richer". The New York Times. ^ Martin Gilens & Benjamin I. Page (2014). "Testing Theories of American Politics: Elites, Interest Groups, and Average Citizens" (PDF). Perspectives on Politics. 12 (3): 564–581. doi:10.1017/S1537592714001595. ^ Christoffersen, John (October 14, 2013). "Rising inequality 'most important problem,' says Nobel-winning economist". St. Louis Post-Dispatch. Retrieved October 19, 2013. ^ Piketty, Thomas (2014). Capital in the Twenty-First Century. Belknap Press. ISBN 067443000X pp. 297–98. ^ a b Winship, Scott (Spring 2013). "Overstating the Costs of Inequality" (PDF). Brookings. Archived from the original (PDF) on October 24, 2013. Retrieved August 12, 2014. ^ "Income Inequality in America: Fact and Fiction" (PDF). e21. Manhattan Institute. May 2014. Retrieved August 14, 2014. ^ Porter, Eduardo (July 30, 2014). "Tyler Cowen on Inequality and What Really Ails America". The New York Times. Retrieved August 12, 2014. ^ Cowen, Tyler (July 19, 2014). "Income Inequality Is Not Rising Globally. It's Falling". The New York Times. Retrieved August 12, 2014. ^ Lucas Jr., Robert E. (May 19, 2011). "The U.S. Recession of 2007–201?" (PDF). Lecture at the University of Washington. Archived from the original (PDF) on August 12, 2014. Retrieved August 12, 2014. ^ Henninger, Daniel (July 13, 2011). "The Disappearing Recovery: What if the weak recovery is all the recovery we are going to get?". The Wall Street Journal. Retrieved August 12, 2014. ^ Stiles, Andrew (May 28, 1014). "The Full Piketty: Experts raise questions about Frenchman's data on income inequality". The Washington Free Beacon. Retrieved August 12, 2014. ^ Feldstein, Martin (May 14, 2014). "Piketty's Numbers Don't Add Up: Ignoring dramatic changes in tax rules since 1980 creates the false impression that income inequality is rising". The Wall Street Journal. Retrieved August 12, 2014. ^ Michael Bordo; Christopher M. Meissner (March 24, 2014). "Does inequality lead to a financial crisis?". Vox. Retrieved August 12, 2014. ^ Hungerford, Thomas L. (December 29, 2011). Changes in the Distribution of Income Among Tax Filers Between 1996 and 2006: The Role of Labor Income, Capital Income, and Tax Policy (Report 7-5700/R42131). Washington, DC: Congressional Research Service. Retrieved January 1, 2014. ^ "Inequality and Poverty" (PDF). OECD. May 2013. Retrieved July 30, 2014. ^ Compare your country: Income distribution and poverty. OECD. ^ a b Woolf, Steven; Aaron, Laudon. "U.S. Health in International Perspective". National Research Council and Institute of Medicine. pp. 171–72. Retrieved April 8, 2013. ^ Vasia Panousi; Ivan Vidangos; Shanti Ramnath; Jason DeBacker; Bradley Heim (Spring 2013). "Inequality Rising and Permanent Over Past Two Decades". Brookings Papers on Economic Activity. Brookings Institution. Archived from the original on April 8, 2013. Retrieved March 23, 2013. ^ Steve Hargreaves (December 18, 2013). The myth of the American Dream. CNN. 2014. ^ DeParle, Jason (January 4, 2012). Harder for Americans to Rise From Lower Rungs. The New York Times. ^ Schneider, Donald (July 29, 2013). "A Guide to Understanding International Comparisons of Economic Mobility". The Heritage Foundation. Retrieved August 12, 2014. ^ Mishel, Lawrence (April 26, 2012). The wedges between productivity and median compensation growth. Economic Policy Institute. ^ Gordon, Robert J. (Spring 2013). "U.S. Productivity Growth: The Slowdown Has Returned After a Temporary Revival" (PDF). International Productivity Monitor, Centre for the Study of Living Standards. 25: 13–19. Archived from the original (PDF) on August 9, 2014. Retrieved July 19, 2014. ^ "Global wage growth stagnates, lags behind pre-crisis rates". December 5, 2014. Retrieved August 10, 2017. ^ Van Dam, Andrew (July 4, 2018). "Is it great to be a worker in the U.S.? Not compared with the rest of the developed world". The Washington Post. Retrieved July 6, 2018. ^ FRED "Household and Non-Profit net worth – Real and Nominal"
^ Economist Gabriel Zucman "Wealth Inequality in the United States Since 1913"
^ Egan, Matt (September 27, 2017). "Record inequality: The top 1% controls 38.6% of America's wealth". CNNMoney. Retrieved October 12, 2017. ^ Steverman, Ben (June 16, 2017). "The U.S. Is Where the Rich Are the Richest". Bloomberg. Retrieved October 22, 2017. ^ Weissmann, Jordan (March 11, 2013). "Yes, U.S. Wealth Inequality Is Terrible by Global Standards". The Atlantic. Retrieved March 16, 2013. ^ Staff (March 18, 2014). "Inequality – Inherited wealth". The Economist. Retrieved August 24, 2014. ^ "Median Household Net Worth by Quintile" (PDF). United States Census. Archived from the original (PDF) on September 12, 2014. ^ "World Wealth Report 2010 – Resource". Retrieved August 10, 2017. ^ a b "Forbes". Forbes. March 14, 2011. ^ Ody, Elizabeth (March 10, 2011). "Carlos Slim Tops Forbes List of Billionaires for Second Year". Bloomberg. Retrieved April 21, 2012. ^ FRED "Homeownership rate for the United States"
^ Millennials aren't buying homes right now. What if they never do? The Guardian. 27 May 2016. ^ Min, Sarah (March 28, 2019). "Average Americans can't afford a home in 70 percent of the country". CBS News. Retrieved April 1, 2019. ^ Derek, Thompson (March 4, 2013). "Corporate Profits Are Eating the Economy". The Atlantic. Retrieved March 18, 2013. ^ "US Census Bureau, females, 18 or older, unemployed, personal income, 2005". Archived from the original on February 5, 2012. Retrieved December 8, 2006. ^ "US Census Bureau, male, 18 or older, employed full-time year round, 2005". Archived from the original on February 5, 2012. Retrieved December 8, 2006. ^ "US Census Bureau, 18+ age, 2005". Archived from the original on February 5, 2012. Retrieved December 8, 2006. ^ "US Census Bureau, Personal income for all sexes, races in 2005". Archived from the original on March 19, 2007. Retrieved November 19, 2006. ^ Desilver, Drew (October 9, 2014). "For most workers, real wages have barely budged for decades". Pew Research Center. Retrieved July 20, 2018. But a look at five decades’ worth of government wage data suggests that the better question might be, why should now be any different? For most U.S. workers, real wages — that is, after inflation is taken into account — have been flat or even falling for decades, regardless of whether the economy has been adding or subtracting jobs. ^ Smith, Noah (July 25, 2018). "How About a Free Market for Wages?". Bloomberg Opinion. Retrieved August 31, 2018. ^ Picchi, Aimee (August 24, 2017). "Vast number of Americans live paycheck to paycheck". CBS News. Retrieved August 25, 2017. ^ Albrecht, Leslie (September 27, 2017). "One-third of American households can't afford food, shelter or medical care". Marketwatch. Retrieved October 6, 2017. ^ Getlen, Larry (July 23, 2018). "America's middle class is slowly being 'wiped out'". MarketWatch. Retrieved July 29, 2018. ^ Long, Heather (February 13, 2019). "Record 7 million Americans are 3 months behind on car payments". boston.com. Retrieved February 15, 2019. ^ Walker, Duncan (March 6, 2013). "The children going hungry in America". BBC News. Retrieved March 13, 2013. ^ Report finds 44 percent of U.S. children live in low-income families. PBS Newshour. April 6, 2015. ^ IMF warns the US over high poverty. BBC, 22 June 2016. ^ a b Kneebone, Elizabeth; Nadeau, Carey; Berube, Alan (November 3, 2011). "The Re-Emergence of Concentrated Poverty: Metropolitan Trends in the 2000s". Brookings Institution. ^ Shah, Neil (October 11, 2013).U.S. Poverty Rate Stabilizes – For Some. The Wall Street Journal (New York). .
^ "HUD 5th Annual Homelessness Assessment Report to Congress, June 2010" (PDF). Retrieved October 20, 2013. ^ Smeeding, T.M. (2005). "Public Policy: Economic Inequality and Poverty: The United States in Comparative Perspective". Social Science Quarterly. 86: 955–83. doi:10.1111/j.0038-4941.2005.00331.x. ^ Kenworthy, L. (1999). "Do Social-Welfare Policies Reduce Poverty? A Cross-National Assessment" (Submitted manuscript). Social Forces. 77 (3): 1119–39. doi:10.1093/sf/77.3.1119. ^ Bradley, D.; E. Huber; S. Moller; F. Nielsen & J.D. Stephens (2003). "Determinants of Relative Poverty in Advanced Capitalist Democracies". American Sociological Review. 68 (1): 22–51. doi:10.2307/3088901. ^ Kevin Drum (September 26, 2013). We Can Reduce Poverty If We Want To. We Just Have To Want To. Mother Jones. ^ Gould, Elise and Wething, Hilary (July 24, 2012). "U.S. poverty rates higher, safety net weaker than in peer countries." Economic Policy Institute. ^ Temin, Peter (2017). The Vanishing Middle Class: Prejudice and Power in a Dual Economy. MIT Press. ISBN 978-0262036160. ^ Alston, Philp (December 15, 2017). "Extreme poverty in America: read the UN special monitor's report". The Guardian. Retrieved December 16, 2017. ^ ""Contempt for the poor in US drives cruel policies," says UN expert". OHCHR. June 4, 2018. Retrieved June 6, 2018. ^ Stephen Haymes, Maria Vidal de Haymes and Reuben Miller (eds), The Routledge Handbook of Poverty in the United States, (London: Routledge, 2015), ISBN 0415673445, pp. 3, 346. ^ "Federal Subsidies for Health Insurance Coverage for People Under Age 65: 2018 to 2028". May 23, 2018. Retrieved June 17, 2018. ^ Bureau, US Census. "Health Insurance Historical Tables –HIC Series". Census. ^ Kronick, Richard (August 2009). "Health Insurance Coverage and Mortality Revisited". Health Services Research. 44 (4): 1211–31. doi:10.1111/j.1475-6773.2009.00973.x. PMC 2739025. ^ Cowen, Tyler (October 5, 2006). "Poor U.S. Scores in Health Care Don't Measure Nobels and Innovation". The New York Times. Retrieved October 9, 2012. ^ Whitman, Glen; Raad, Raymond. "Bending the Productivity Curve: Why America Leads the World in Medical Innovation". The Cato Institute. Retrieved October 9, 2012. ^ ""U.S. Health in International Perspective: Shorter Lives, Poorer Health" (2013) National Institutes of Health Committee on Population, Board on Population Health and Public Health Practice". Books.nap.edu. Retrieved October 20, 2013. ^ Martin, Nicole (August 21, 2007). "UK cancer survival rate lowest in Europe". The Telegraph. Retrieved August 19, 2013. ^ Verdecchia, A; Francisci, S; Brenner, H; Gatta, G; Micheli, A; Mangone, L; Kunkler, I; EUROCARE-4 Working, Group (September 2007). "Recent cancer survival in Europe: a 2000–02 period analysis of EUROCARE-4 data". The Lancet Oncology. 8 (9): 784–96. doi:10.1016/s1470-2045(07)70246-2. PMID 17714993. ^ MD, Scott W. Atlas, (2011). In excellent health : setting the record straight on America's health care and charting a path for future reform. Stanford, California: Hoover Institution Press, Stanford University. pp. 199–205. ISBN 978-0817914448. ^ Wolf-Maier, K. (November 24, 2003). "Hypertension Treatment and Control in Five European Countries, Canada, and the United States". Hypertension. 43 (1): 10–17. doi:10.1161/01.HYP.0000103630.72812.10. PMID 14638619. Retrieved August 19, 2013. ^ O'Neill, June E.; O'Neill, Dave M. (2008). "Health Status, Health Care and Inequality: Canada vs. the U.S". Forum for Health Economics & Policy. 10 (1). doi:10.2202/1558-9544.1094. ^ McDonald, Andy (September 28, 2018). "U.S. Drops To 27th In The World For Education And Health Care". The Huffington Post. Retrieved October 6, 2018. ^ "FastStats". www.cdc.gov. July 18, 2017. ^ Conover, Christopher J. (October 4, 2004). "Health Care Regulation A $169 Billion Hidden Tax" (PDF). Cato Institute. Retrieved September 2, 2014. ^ a b "Why Does Health Care Cost so Much in America? Ask Harvard's David Cutler". Public Broadcasting Service. ^ Lawler, Joseph (September 19, 2012). "Health Care Economist John Goodman on Market-Based Health Care". Real Clear Policy. Retrieved September 2, 2014. ^ "Medicaid Pays Less Than Medicare for Many Prescription Drugs, U.S. Report Finds". The New York Times. ^ Dobson, A.; DaVanzo, J.; Sen, N. (January 1, 2006). "The Cost-Shift Payment 'Hydraulic': Foundation, History, And Implications". Health Affairs. 25 (1): 22–33. doi:10.1377/hlthaff.25.1.22. PMID 16403741. ^ Pope, Christopher (August 9, 2013). "Legislating Low Prices: Cutting Costs or Care?". The Heritage Foundation. Retrieved September 2, 2014. ^ "Manufacturing Output by Country". imt. Retrieved April 4, 2014. ^ Martin Crutsinger (April 20, 2007). "Factory jobs: 3 million lost since 2000". USA Today. Associated Press. Retrieved March 4, 2012. ^ Michael Lind (December 1, 2011). "The Cost of Free Trade". The American Prospect. Retrieved March 3, 2012. ^ "What Accounts for the Decline in Manufacturing Employment?". February 18, 2004. Retrieved August 10, 2017. ^ UNESCO Science Report: towards 2030. Paris: UNESCO Publishing. 2015. p. 141. ISBN 978-9231001291. ^ "Manufacturing Output by Country". Greyhill Advisors. Retrieved October 5, 2011. ^ "What Accounts for the Decline in Manufacturing Employment?". Congressional Budget Office. Retrieved October 5, 2011. ^ Harold Meyerson (November 29, 2011). "Back from China?". The American Prospect. Retrieved March 4, 2012. ^ Carl Pope (January 18–20, 2012). "America's Dirty War Against Manufacturing: Part 1". Bloomberg. Retrieved January 22, 2012. Part 2. Part 3. ^ Dean Baker (January 22, 2012). "Hasn't Anyone at the NYT Heard of Exchange Rates?". Beat the Press. Center for Economic and Policy Research. Retrieved January 22, 2012. ^ "Interstate FAQ (Question #3)". Federal Highway Administration. 2006. Retrieved March 4, 2009. ^ "Public Road and Street Mileage in the United States by Type of Surface". United States Department of Transportation. Retrieved January 13, 2015. ^ "China Expressway System to Exceed US Interstates". New Geography. Grand Forks, ND. January 22, 2011. Retrieved September 16, 2011. ^ "China overtakes US in car sales". The Guardian. London. January 8, 2010. Retrieved July 10, 2011. ^ "Motor vehicles statistics – countries compared worldwide". NationMaster. Retrieved July 10, 2011. ^ "Household, Individual, and Vehicle Characteristics". 2001 National Household Travel Survey. U.S. Dept. of Transportation, Bureau of Transportation Statistics. Archived from the original on September 29, 2007. Retrieved August 15, 2007. ^ Renne, John L.; Wells, Jan S. (2003). "Emerging European-Style Planning in the United States: Transit-Oriented Development" (PDF). Rutgers University. p. 2. Archived from the original (PDF) on September 24, 2014. Retrieved June 11, 2007. ^ Benfield, Kaid (May 18, 2009). "NatGeo surveys countries' transit use: guess who comes in last". Natural Resources Defense Council. Archived from the original on January 20, 2015. Retrieved January 6, 2015. ^ "Intercity Passenger Rail: National Policy and Strategies Needed to Maximize Public Benefits from Federal Expenditures". U.S. Government Accountability Office. November 13, 2006. Retrieved June 20, 2007. ^ "The Economist Explains: Why Americans Don't Ride Trains". The Economist. August 29, 2013. Retrieved May 12, 2015. ^ "Amtrak Ridership Records". Amtrak. June 8, 2011. Retrieved February 29, 2012. ^ McGill, Tracy (January 1, 2011). "3 Reasons Light Rail Is an Efficient Transportation Option for U.S. Cities". MetaEfficient. Retrieved June 14, 2013. ^ "Privatization". www.downsizinggovernment.org. Cato Institute. Retrieved December 27, 2014. ^ "Scheduled Passengers Carried". International Air Transport Association (IATA). 2011. Archived from the original on November 13, 2013. Retrieved February 17, 2012. ^ "Preliminary World Airport Traffic and Rankings 2013 – High Growth Dubai Moves Up to 7th Busiest Airport — Mar 31, 2014". Airports Council International. March 31, 2014. Archived from the original on April 1, 2014. Retrieved May 17, 2014. ^ Pleven, Liam (November 30, 2011). "The Wall Street Journal". The Wall Street Journal. Retrieved April 21, 2012. ^ Kahn, Chris (December 31, 2011). "In a first, gas and other fuels top U.S. exports". Florida Today. Melbourne, FL. p. 4A. Archived from the original on March 11, 2012. ^ "Crying wolf about protectionism". chinadaily.com.cn. ^ "Global Trade Alert – Independent monitoring of policies that affect world trade". globaltradealert.org. ^ "China overtakes US as world's largest goods trader". Financial Times. Retrieved January 10, 2014. ^ "Free exchange: Petrodollar profusion". The Economist. ^ "U.S. International Trade in Goods and Services" (PDF). BEA. February 5, 2015. ^ "IMF: US accounts for one-third of annual remittances to Developing Countries of $100bn". Finfacts.com. Retrieved April 21, 2012. ^ "This chart shows how America stacks up in trade with everyone in the world". Business Insider. Retrieved March 20, 2018. 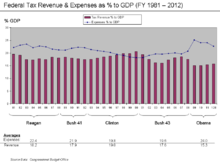 ^ FY 2010 Budget Historical Tables. pp. 127–28. ^ "US spends its way to 28 Eiffel towers: made out of pure gold". The Times. March 17, 2006. ^ "Senate backs increase in debt limit to $14.3 trillion". Reuters. January 28, 2010. ^ "2010 Budget-Summary Tables S-13 and S-14" (PDF). Archived from the original (PDF) on October 10, 2011. Retrieved July 21, 2014. ^ "Debt has become America's life blood". Abc.net.au. December 15, 2009. ^ "Wave of Debt Payments Facing US Government". The New York Times. November 22, 2009. ^ "Analytical Perspectives of the FY 2008 Budget Archived January 7, 2010, at the Wayback Machine". ^ "Major Foreign Holders of Treasury Securities". United States Department of the Treasury. July 2014. Archived from the original on October 17, 2015. Retrieved August 23, 2014. ^ Federal Reserve (June 5, 2014). "Z.1 Financial Accounts of the United States – Flow of Funds, Balance Sheets, and Integrated Macroeconomic Accounts – First Quarter 2014" (PDF). Archived from the original (PDF) on July 2, 2010. Retrieved July 3, 2010. ^ Federal Reserve (June 5, 2014). "Z.1 Financial Accounts of the United States – Flow of Funds, Balance Sheets, and Integrated Macroeconomic Accounts – Historical Annual Tables 2005–2013" (PDF). Archived from the original (PDF) on August 13, 2014. ^ U.S. Treasury (January 31, 2012) "Minutes of the Meeting of the Treasury Borrowing Advisory Committee of the Securities Industry and Financial Markets Association"
^ "The Implementation of Monetary Policy – The Federal Reserve in the International Sphere" (PDF). Retrieved April 21, 2012. ^ "Biggest game in town". BBC News. January 29, 2009. ^ "Currency Composition of Official Foreign Exchange Reserves (COFER) – June 30, 2011" (PDF). Retrieved April 21, 2012. ^ Rooney, Ben (February 10, 2011). "IMF calls for dollar alternative". CNN. Retrieved March 28, 2012. ^ "Enabling Trade Index 2014". World Economic Forum. ^ "2014 Global Competitiveness Report" (PDF). ^ a b "2014 Index of Economic Freedom – United States". Heritage Foundation. Retrieved January 14, 2014. ^ Terry, Miller (January 13, 2014). "America's Dwindling Economic Freedom Regulation, taxes and debt knock the U.S. out of the world's top 10". Wall Street Journal. Retrieved January 14, 2014. ^ "2014 Index of Economic Freedom". Heritage Foundation. Retrieved January 14, 2014. ^ "Bush's Regulatory Kiss-Off – Obama's assertions to the contrary, the 43rd president was the biggest regulator since Nixon". Reason magazine. January 2009. ^ Porter, Eduardo (August 14, 2012). "America's Aversion to Taxes". The New York Times. Retrieved August 15, 2012. In 1965, taxes collected by federal, state and municipal governments amounted to 24.7 percent of the nation's output. In 2010, they amounted to 24.8 percent. Excluding Chile and Mexico, the United States raises less tax revenue, as a share of the economy, than every other industrial country. ^ "Is the US Really a Nation of God-Fearing Darwin-Haters?". Der Spiegel. June 6, 2009. ^ a b Yglesias, Matthew (March 6, 2013). "America Does Tax Wealth, Just Not Very Intelligently". Slate. Retrieved March 18, 2013. ^ a b "The Distribution of Household Income and Federal Taxes, 2010". The US Congressional Budget Office (CBO). December 4, 2013. Retrieved August 13, 2014. ^ Prasad, M.; Deng, Y. (April 2, 2009). "Taxation and the worlds of welfare". Socio-Economic Review. 7 (3): 431–57. doi:10.1093/ser/mwp005. Retrieved May 5, 2013. ^ Matthews, Dylan (September 19, 2012). "Other countries don't have a "47%"". The Washington Post. Retrieved October 29, 2013. ^ Stephen, Ohlemacher (March 3, 2013). "Tax bills for rich families approach 30-year high". The Seattle Times. Associated Press. Retrieved April 3, 2013. ^ Bair, Sheila (February 26, 2013). "Grand Old Parity". The New York Times. Retrieved March 18, 2013. ^ Hodge, Scott A. (April 29, 2005). "The Case for a Single-Rate Tax: Why Our Progressive Tax Code is Inconsistent with the Changing Face of American Taxpayers". Tax Foundation. Retrieved August 13, 2014. ^ Frank, Robert (March 26, 2011). "The Price of Taxing the Rich: The top 1% of earners fill the coffers of states like California and New York during a boom—and leave them starved for revenue in a bust". The Wall Street Journal. Retrieved August 13, 2014. ^ Kumar, Vishesh. "Is Rising U.S. Debt Inviting Trouble? Ask Japan". Daily Finance. Retrieved May 18, 2010. ^ "Where the millionaires are now". MSN. October 22, 2007. Retrieved April 21, 2012. ^ Walker, William (1993). "National Innovation Systems: Britain". In Nelson, Richard R. (ed.). National innovation systems : a comparative analysis. New York: Oxford University Press. pp. 61–64. ISBN 978-0195076172. ^ Jeanette Altarriba; Roberto R. Heredia (2007). An Introduction to Bilingualism: Principles and Processes. Taylor & Francis. p. 212. ISBN 978-0203927823. ^ Benedetti, François (December 17, 2003). "100 Years Ago, the Dream of Icarus Became Reality". Fédération Aéronautique Internationale (FAI). Archived from the original on September 12, 2007. Retrieved August 15, 2007. ^ "Mandelson, Peter. "There is no Google, or Amazon, or Microsoft or Apple in the UK, Mandelson tells BVCA." BriskFox Financial News, March 11, 2009". Briskfox.com. Retrieved April 21, 2012. ^ Venture Impact (5 ed.). IHS Global Insight. 2009. p. 2. ISBN 978-0978501570. Archived from the original on June 30, 2014. ^ a b c d e f g h i j k l m n Stewart, Shannon; Springs, Stacy (2015). United States of America. In: UNESCO Science Report: towards 2030 (PDF). Paris: UNESCO. pp. 129–55. ISBN 978-9231001291. ^ Sohl, Jeffrey (March 31, 2010). "Full Year 2009 Angel Market Trends" (PDF). University of New Hampshire Center for Venture Research. Archived from the original (PDF) on January 20, 2013. Retrieved September 27, 2011. ^ "M&A US – Mergers & Acquisitions in the United States". IMAA-Institute. Retrieved February 22, 2018. ^ "FT 500 2013". ft.com. ^ "Apple usurps Google as world's most valuable brand". May 9, 2011. Retrieved August 10, 2017 – via Reuters. ^ "Speaking out Welcoming the halal traveller". www.ttnworldwide.com. Archived from the original on December 20, 2016. Retrieved December 16, 2016. ^ "Fortune 500 Companies 2017: Who Made the List". Fortune. Archived from the original on January 5, 2006. Retrieved August 10, 2017. ^ Yahoo! Finance – Business Finance, Stock Market, Quotes, News. Finance.yahoo.com. ^ a b "WFE – YTD Monthly". Web.archive.org. November 6, 2011. Archived from the original on November 6, 2011. Retrieved June 8, 2014. ^ "> Data Products > NYSE > Facts & Figures". NYXdata. Retrieved April 21, 2012. ^ Origins of Stock Market Fluctuations. New York University, December 16, 2014. ^ Stock quotes, investing & personal finance, news – MSN Money. Money.msn.com (December 31, 1999). ^ Investor Relations. Goldman Sachs..
^ "Financial and investor information from U.S. Bank". www.usbank.com. ^ Tankersley, Jim (December 16, 2014). "A black hole for our best and brightest". The Washington Post. Retrieved December 23, 2014. ^ Cecchetti, Stephen G; Kharroubi, Enisse. "Why does financial sector growth crowd out real economic growth?" (PDF). BIS Working Papers No 490. Bank for International Settlements. Retrieved September 20, 2015. ^ Ravikumar, B.; Shao, Lin. 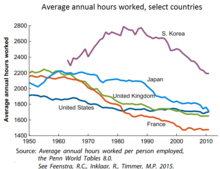 "Labor Compensation and Labor Productivity: Recent Recoveries and the Long-Term Trend". research.stlouisfed.org. ^ Kenworthy, Lane (July 10, 2011). 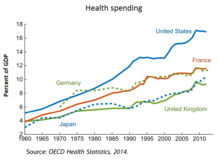 "America's inefficient health-care system: another look". Consider the Evidence (blog). Retrieved September 11, 2012. ^ "T13-0174 – Average Effective Federal Tax Rates by Filing Status; by Expanded Cash Income Percentile, 2014". Tax Policy Center. July 25, 2013. Archived from the original on December 11, 2014. Retrieved November 3, 2013. ^ "Table 7.3 – Statutory Limits on Federal Debt: 1940–Current". Office of Management and Budget. Retrieved December 25, 2013. Wikimedia Commons has media related to Economy of the United States. Income inequality in the United States is the extent to which income is distributed in an uneven manner among the American population. 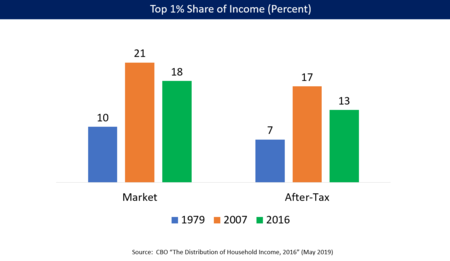 The inequality has increased significantly since the 1970s after several decades of stability, meaning the share of the nation's income received by higher income households has increased. This trend is evident with income measured both before taxes as well as after taxes and transfer payments, but diminishes to a significant extent if in-kind compensation is considered, such as employer-paid healthcare premiums, which have increased dramatically over the same time period. Income inequality has fluctuated considerably since measurements began around 1915, moving in an arc between peaks in the 1920s and 2000s, with a 30-year period of relatively lower inequality between 1950–1980. Recasting the 2012 income using the 1979 income distribution, the bottom 99% of families would have averaged about $7,100 more income. Wealth inequality in the United States is the unequal distribution of assets among residents of the United States. Wealth includes the values of homes, automobiles, personal valuables, businesses, savings, and investments. The net worth of U.S. households and non-profit organizations was $94.7 trillion in the first quarter of 2017, a record level both in nominal terms and purchasing power parity. If divided equally among 124 million U.S. households, this would be $760,000 per family; however, the bottom 50% of families, representing 62 million American households, average $11,000 net worth. From an international perspective, the difference in US median and mean wealth per adult is over 600%. 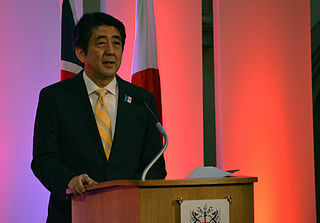 Abenomics refers to the economic policies advocated by Shinzō Abe since the December 2012 general election, which elected Abe to his second term as Prime Minister of Japan. Abenomics is based upon "three arrows" of monetary easing, fiscal stimulus and structural reforms. The Economist characterized the program as a "mix of reflation, government spending and a growth strategy designed to jolt the economy out of suspended animation that has gripped it for more than two decades". The economic policies of Donald Trump, which were outlined in his campaign pledges, include trade protectionism, immigration reduction, individual and corporate tax reform, the dismantling of the Dodd–Frank Wall Street Reform and Consumer Protection Act, and the repeal of the Patient Protection and Affordable Care Act ("Obamacare").